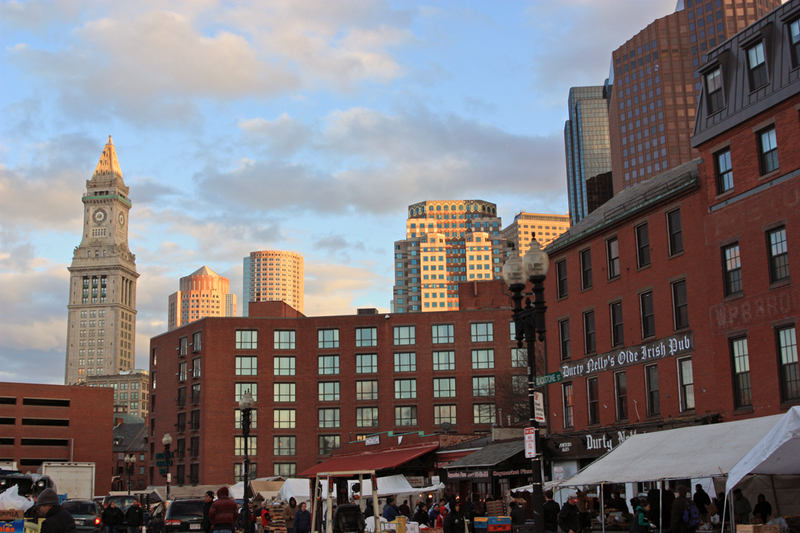 Twilight in Boston as I walk the Freedom Trail. 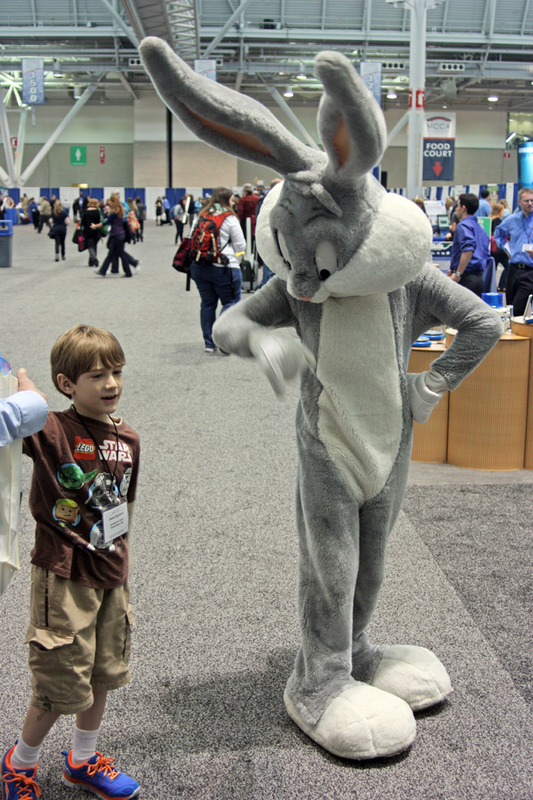 On Saturday, April 7, 2014 I was in Boston attending the National Science Teachers Association conference. After the Aerospace Educators Luncheon featuring astronaut Joe Acaba was over, I decided to take the afternoon and explore the city. 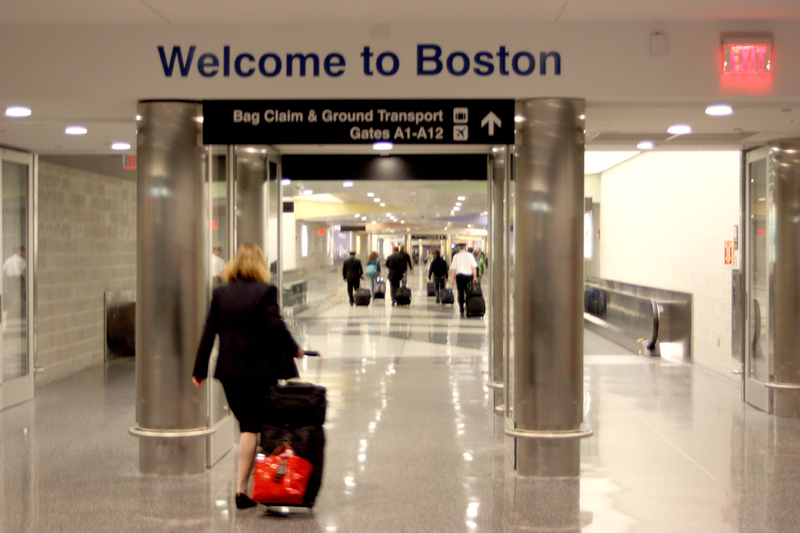 I had never been to Boston before, and this might be my only chance. I had always loved studying the Revolutionary War, but had never really known all the details of the events that led up to the War. I hope through this post to put the events and the places together for you and help clear up some the same misconceptions I’ve always had. 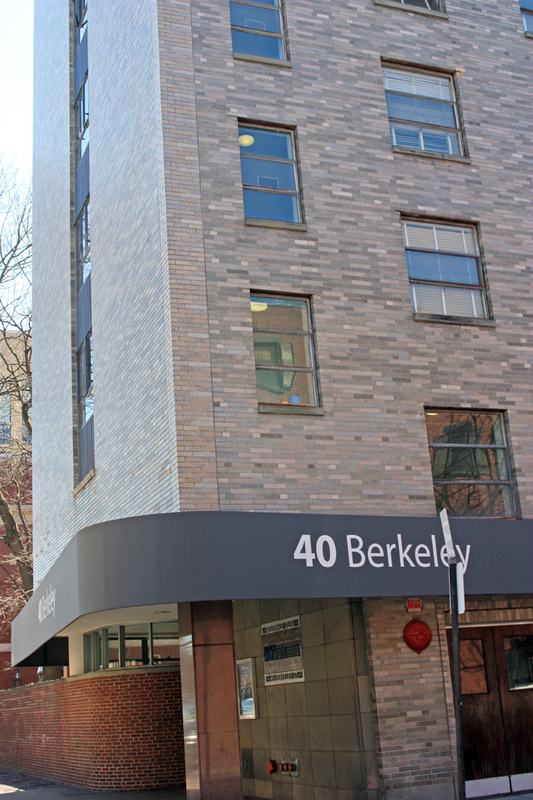 It was about 3:00 when I set out from my hostel at 40 Berkeley St. 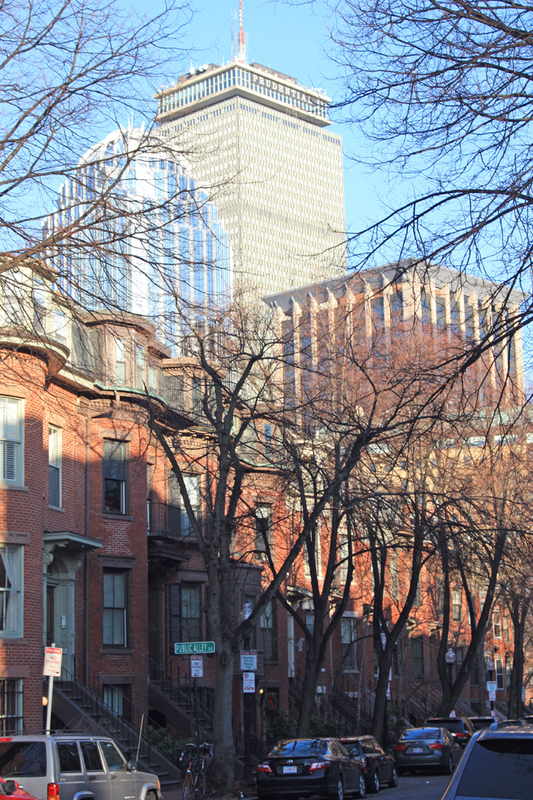 I had already walked around the area enough to know my way to Boston Common, where my exploration began. 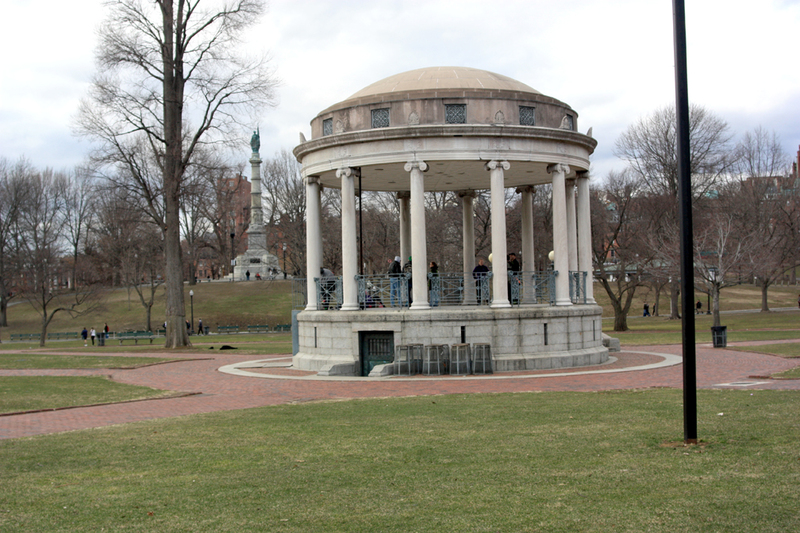 I crossed to a pavilion and on to the northeast corner of the Common, where the Massachusetts State House stands. 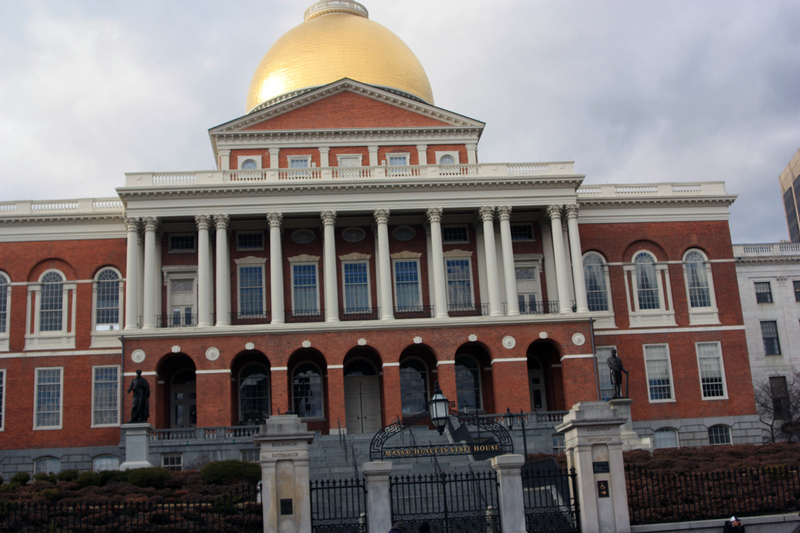 It was finished in 1795 when Samuel Adams was governor of the state, and the dome was originally sheathed in copper by Paul Revere from his newly established copper sheeting business. It is now gilded in gold. 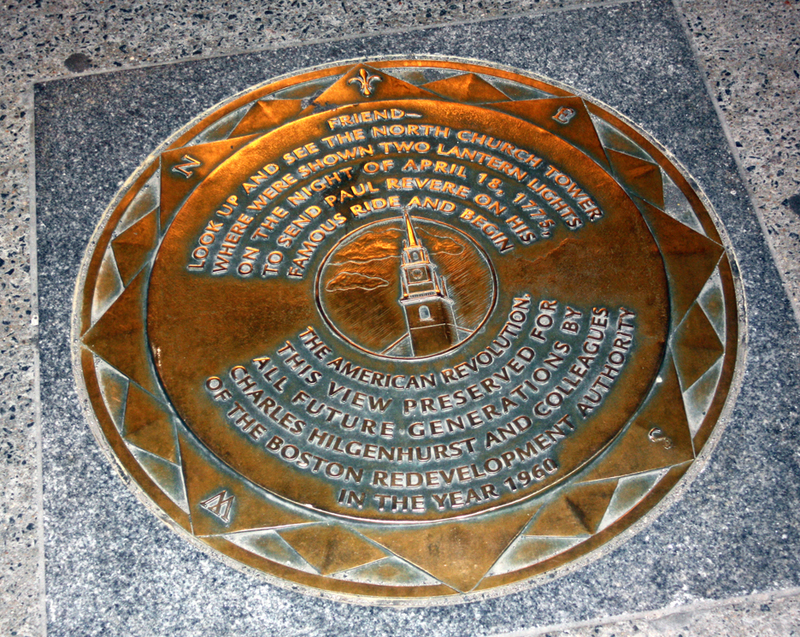 Speaking of Paul Revere and Sam Adams, they apparently laid down a time capsule as the state house was finished, which was just rediscovered about a week ago as I write this (Dec. 27, 2014). There was water leaking around part of the foundation, and workers discovered the box as they were making repairs. They plan to open it in a few days. Much of what I was about to see and explore was influenced by those two men, and a type of electronic time capsule about them and the city they walked in is what I want this blog post to be. 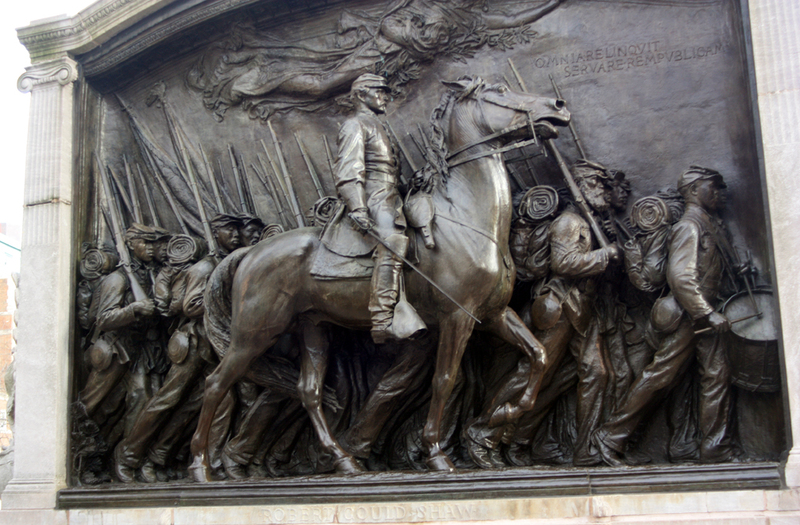 Just across the street on the edge of the Commons stands a memorial to Robert Gould Shaw, a Colonel in command of the Massachusetts 54th Infantry Regiment during the Civil War. This was the all black regiment that led the assault on Ft. Wagner in July, 1863. 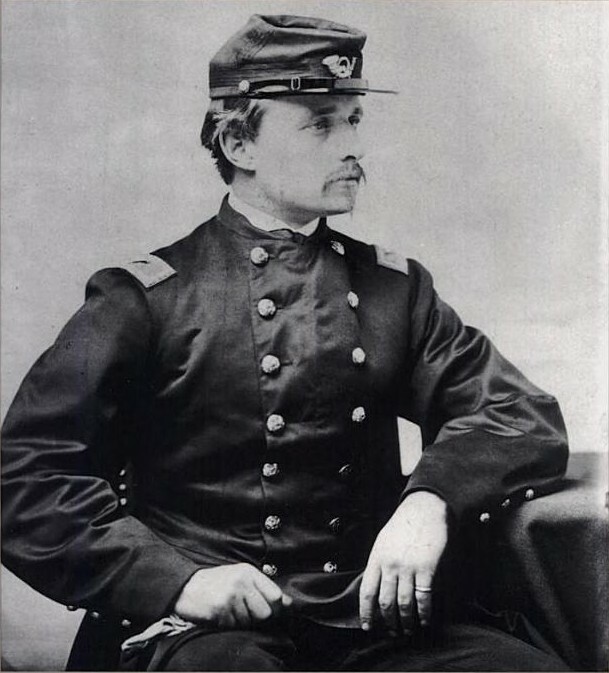 Many lost their lives in that charge, including Colonel Shaw. Their experiences training and gaining equal pay and treatment were immortalized in the movie “Glory.” This is the original monument – I have seen a gilded plaster copy of it in the National Museum of Art in Washington, D.C. 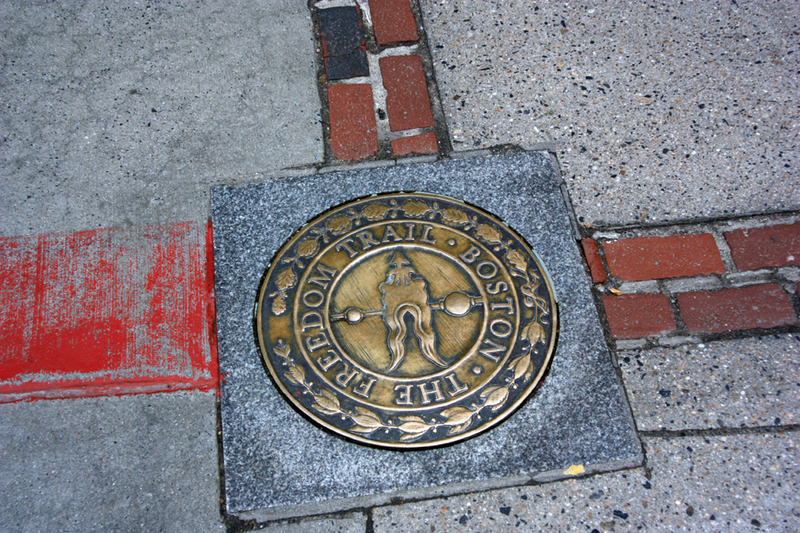 The Freedom Trail basically starts here; to walk it, one must follow a red line of bricks laid into the sidewalks. 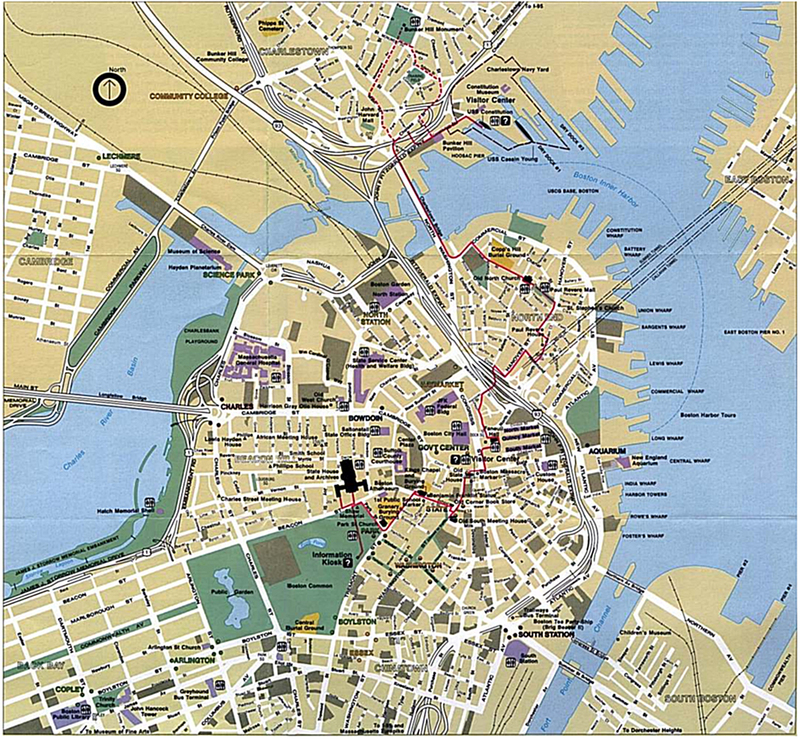 It zigzags across the city, over the Charles River, and ends at the Bunker Hill Memorial. From the State House it crosses the Commons to the southeast corner and the North Park Church. 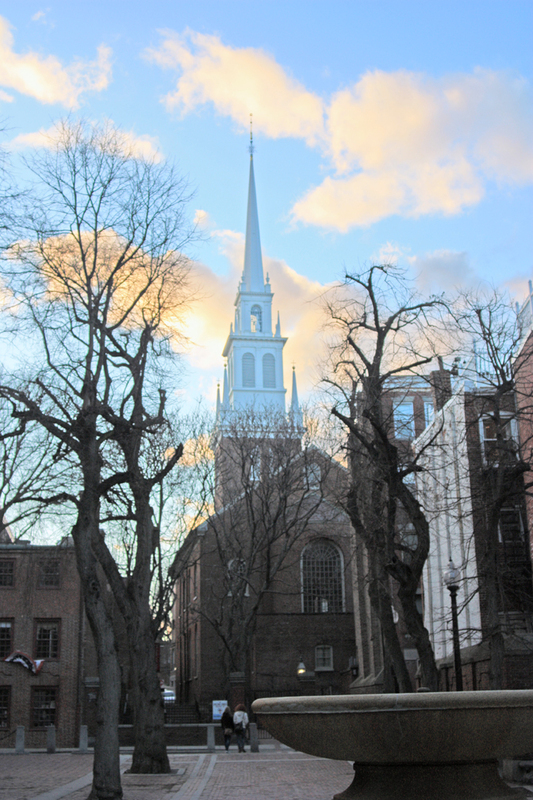 It turns past the church and passes the Granary Burial Grounds, where Paul Revere and Sam Adams are buried. 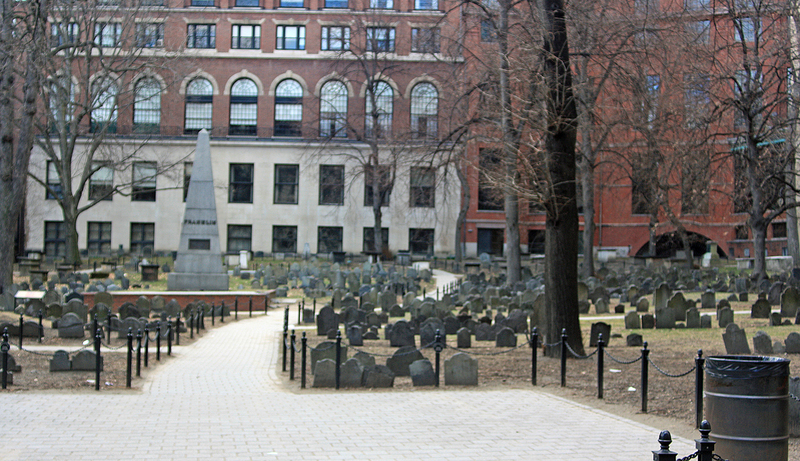 The victims of the Boston Massacre are buried here as well. More on this later. I followed the line of red bricks past one of the first schools in America and past the Old City Hall. I turned a corner where the route looped back on itself, and bought a hot dog from a street vender’s cart. There was a bookstore there called the Old Corner Bookstore that I poked around in for a moment before continuing. It wasn’t until later, researching the route, that I discovered it was frequented by Thoreau and Emerson. Since I couldn’t get out to Concord to see Walden Pond (I teach at Walden School, after all), it was good that I at least got to browse where he used to browse. I passed a Potbelly Sandwich Works and I was still hungry (the hot dog had only whetted my appetite), so I stopped in and got a Wreck. It was tasty. Had I known what I was about to find, I might have waited. 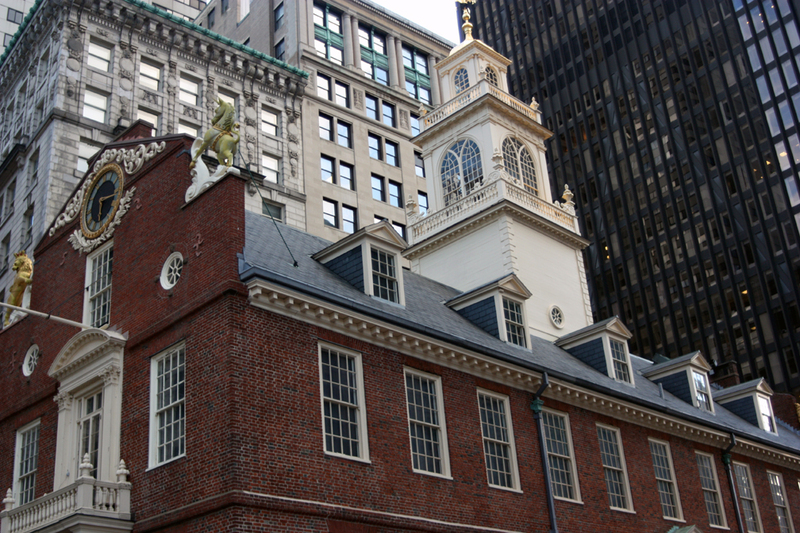 I walked on past the Old State House, a red brick building with a spire trimmed in gilded edges. There were so many things to see, and so many historic plaques to read that I didn’t notice a plain circle of cobblestones inset into the walkway. It was the site of the Boston Massacre. Old State House. The square near where I took this photograph is the site of the Boston Massacre. The Seven Years War (known in America as the French and Indian War) had cost the British a great deal, and new sources of revenue were explored. Parliament thought it only natural that the Colonies should pay back the cost of protecting them during the war, and a series of taxes were levied on Colonial goods, including molasses, sugar, paper, etc. During the late 1760s, the colonists began to protest, for both economic and political reasons. 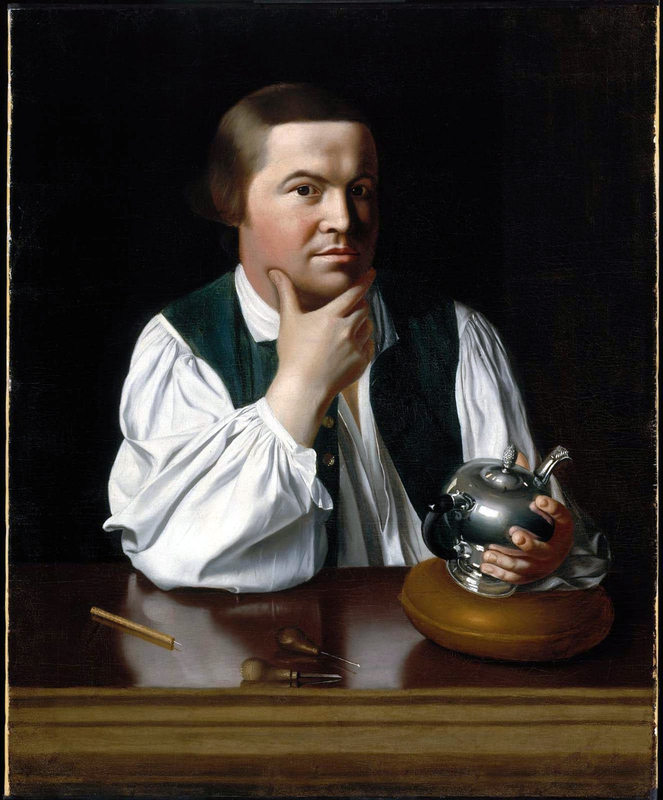 Sam Adams wrote instructions for the delegates of the Massachusetts Assembly that pointed out a leading concern for the colonists: did the Parliament in England have the right to levy taxes against the Colonies without their permission or representation? As the protests grew, mobs destroyed customs houses, hung public officials in effigy, and became increasingly vocal and agitated. Charles Townshend, Chancellor of the Exchequer for Great Britain, proposed a series of acts that would also raise revenue to directly pay governors and other public officials (instead of them being paid by the colonial assemblies), thereby removing them from colonial control. More protests broke out, and the situation spiraled downhill. 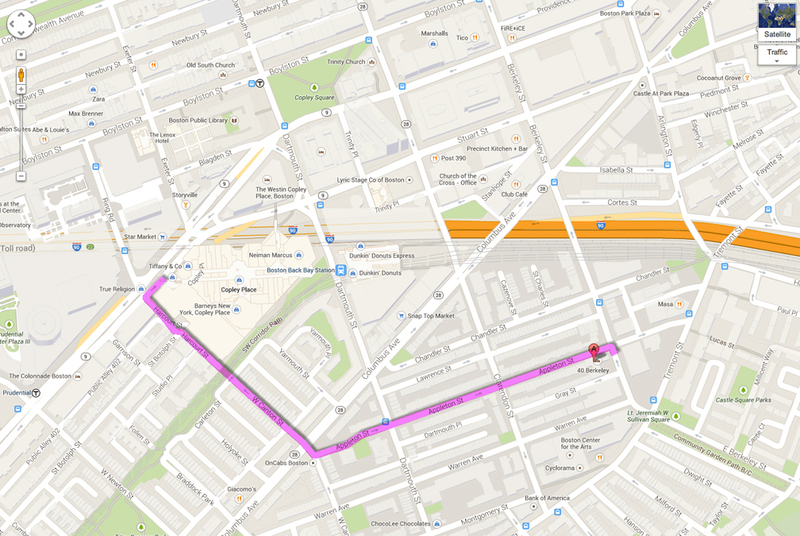 Detailed map of the Freedom Trail in Boston. At this point in my journey, I was in the Quincy Market area. The Crown appointed governor, fearing what he saw as lawlessness in Boston, asked for British soldiers to be posted in the city. Instead of ensuring the peace, the soldiers’ presence only fanned the flames. 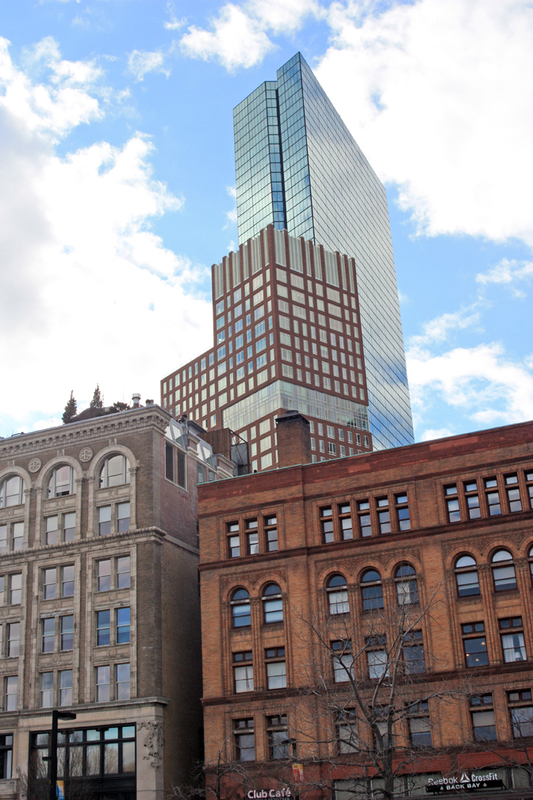 In 1770, a group of British regulars was harassed by a mob of angry Bostonians. No one is entirely sure what happened, but the soldiers opened fire and five men were killed outright or died from wounds and another six were wounded. Sam Adam’s second cousin, John Adams, made himself a name as a lawyer by defending six of the British soldiers, getting them acquitted on the grounds that they were only following orders. 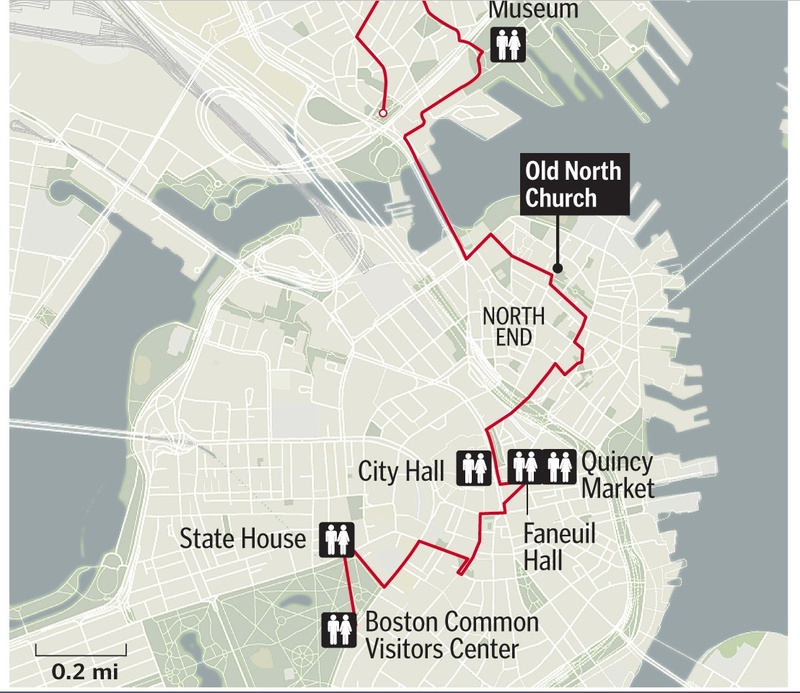 A simplified map of the Freedom Trail in Boston. This incident became the rallying point for an escalating series of protests against the British government’s policies. 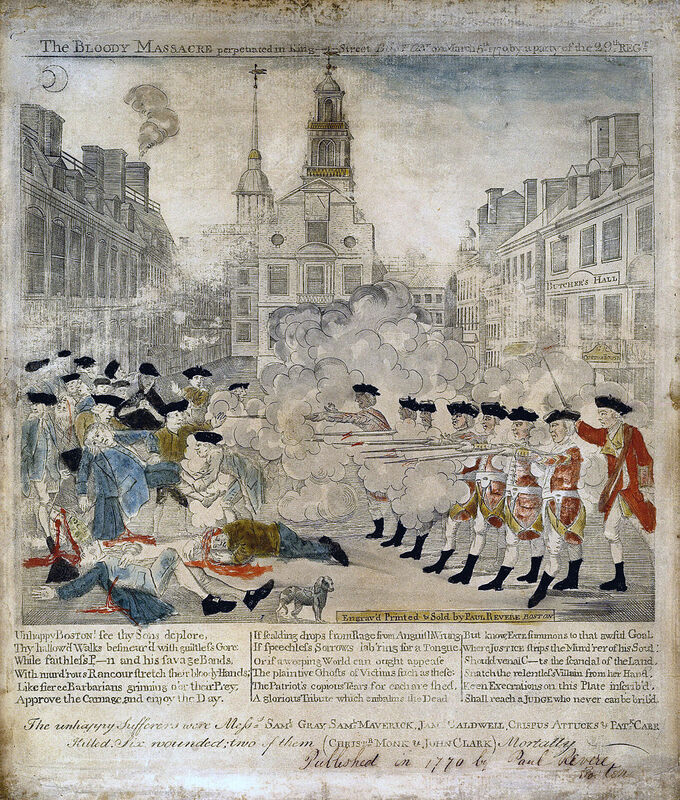 Paul Revere created a famous engraving of the massacre, which was printed and colored by hand. Most of the Townshend Acts were repealed, but one remained: the tax on tea. This law was strengthened and enforced, giving the East India Company a monopoly on the tea trade and cutting out the middlemen tea merchants in the colonies. It also undercut the price of tea, thereby killing the profit of tea merchants who were smuggling in Dutch tea. 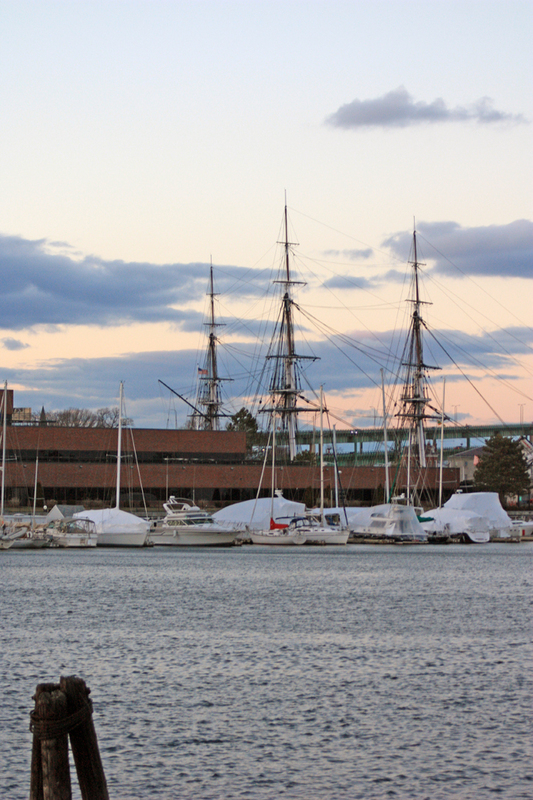 Several ships loaded with tea were stuck in Boston Harbor unable to unload their cargo. The governor refused to let them leave, thereby supporting the Crown’s policies. When a fresh wave of protests broke out, Governor Thomas Hutchinson disbanded the Boston Town Meeting, which was the local city government. 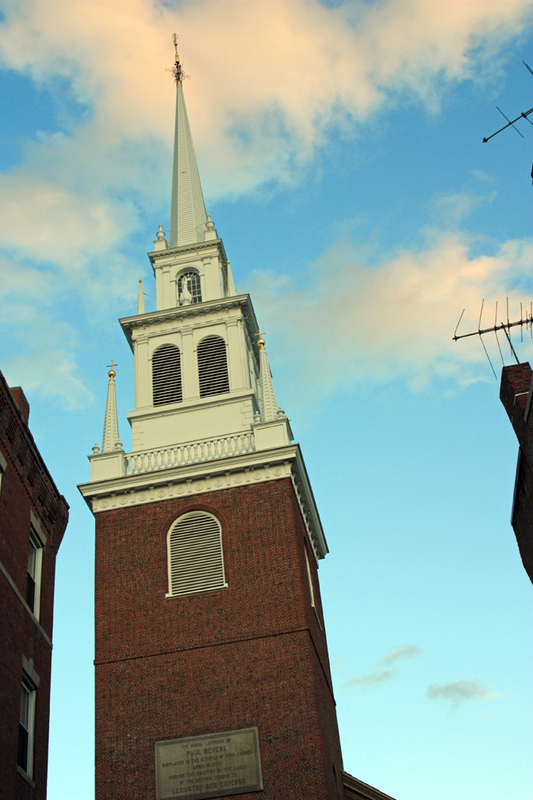 Sam Adams called for a town meeting anyway, and thousands showed up on the evening of Dec. 16, 1773. Faneuil Hall in Boston. At a meeting led by Sam Adams on Dec. 16, 1773, a group of men initiated the Boston Tea Party. 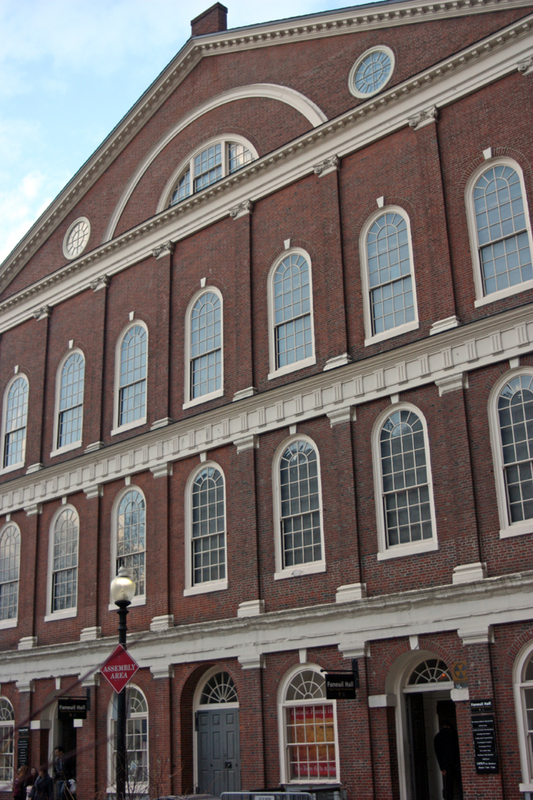 I passed Faneuil Hall, where this meeting was held. Emotions ran high, and a group of about 100 men left the meeting and headed down to the harbor, where they proceeded to dump the tea into the water. The British government overreacted again, passing a series of laws called the Coercive Acts (known as the Intolerable Acts in America), which closed Boston Harbor and repealed the Charter from King Charles that allowed Boston to have self-government. British soldiers were quartered in prominent citizens’ homes, partly to act as spies. They were allowed to search and seize any properties that might be used to support the growing rebellion without a warrant. 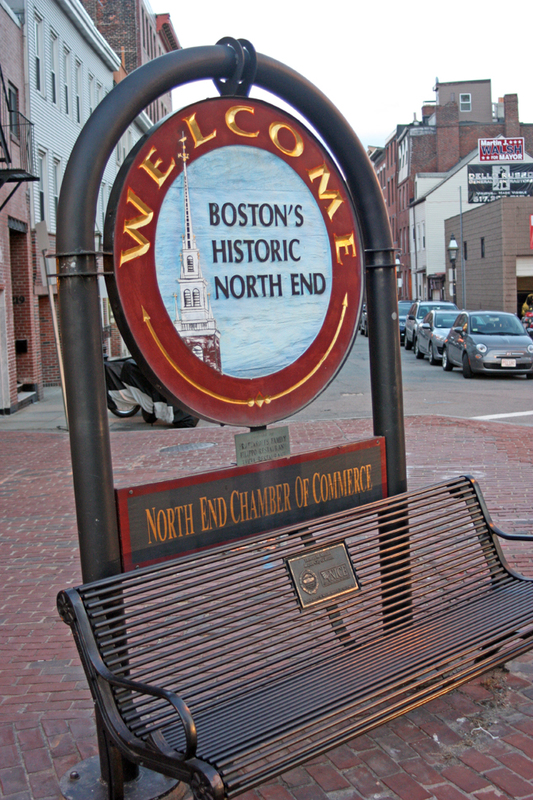 No public meetings were allowed and arms were confiscated; basically, Boston was under siege. One of the many food stalls inside Quincy’s Market. 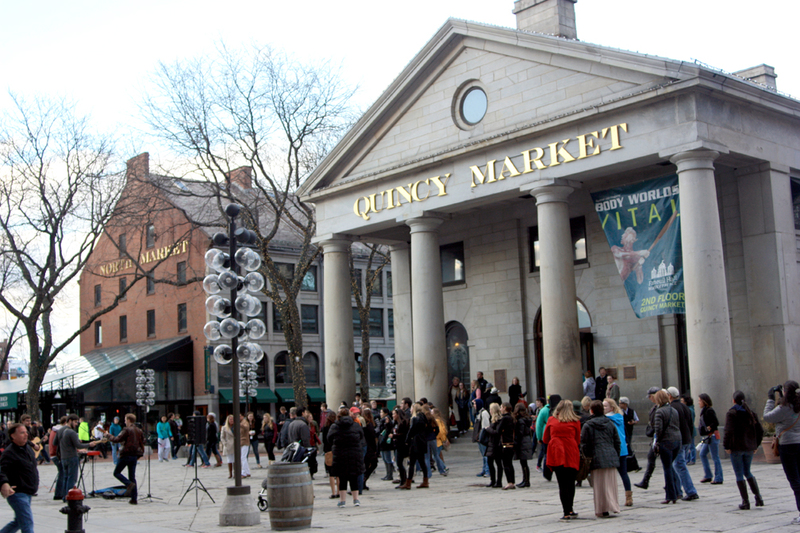 I crossed the square by Faneuil Hall to the Quincy Market, then and now a gathering place and market in what was then central Boston. There are three long buildings side by side, much like shopping malls today with individual businesses lining the hallway in each building. There was a street band playing in the square, and I couldn’t help contrasting this with the civil unrest and anxiety that marked those days in the early 1770s. 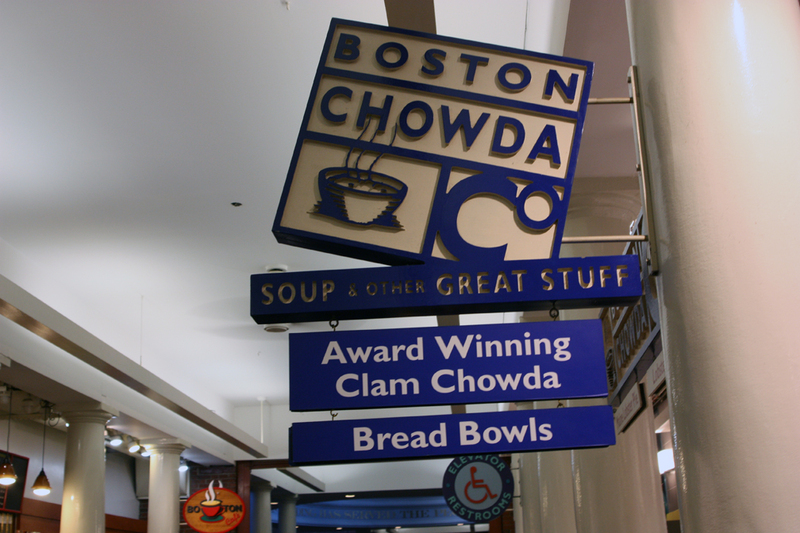 When I saw the different food venders in Quincy Market, I wished I had left some room for chowda or crab cakes or other local fare. I will remember next time. I ran into Coral Clark with some other SOFIA Airborne Astronomy Ambassadors there. 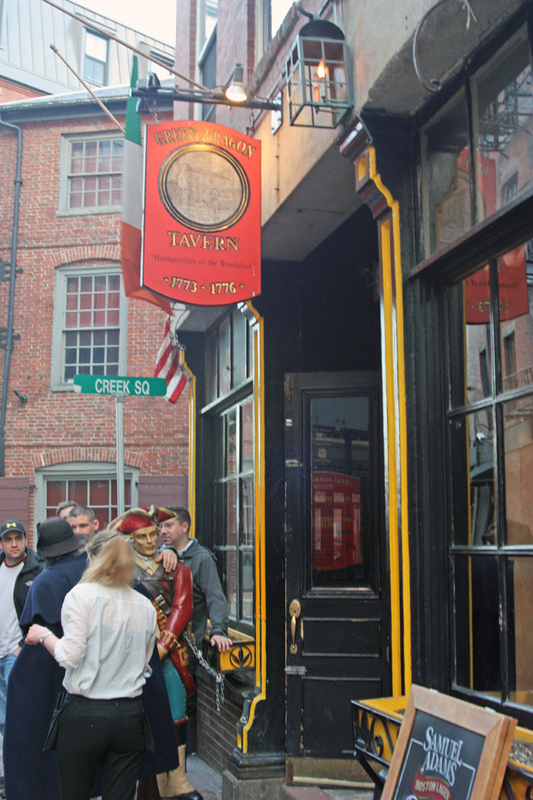 A recreation of the Green Dragon Tavern, where the Sons of Liberty planned the rebellion. I followed the red line beyond Quincy Market. It led further north into an alleyway past the Green Dragon Pub. This is not the original pub, which was located nearby on Union Street, but it gives a feeling of what it might have been like. Even before the Boston Tea Party, the leaders of the protests had to go into hiding. A group of men called the Sons of Liberty met in the basement of the Green Dragon to plan their next moves. They organized Committees of Correspondence to carry the news of the British crackdown on Boston to the other colonies and to convince them that common action was needed. Governor Hutchinson was recalled, and a new governor appointed by the Crown: General Thomas Gage. He had previously served alongside George Washington in the French and Indian War and was promoted to be the commander in chief of all the armed forces in the colonies. As governor he enforced the Coercive Acts and cracked down on dissent. He dissolved the Massachusetts Assembly, partly because they had sent delegates (including Sam Adams) to the first Continental Congress in Philadelphia. 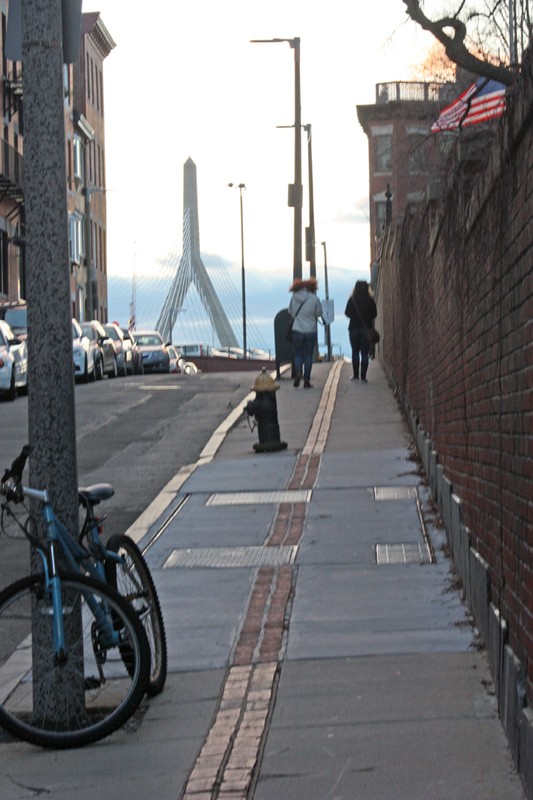 I crossed over into the old North End of Boston, continuing to follow the red line. I missed a turn at an intersection and continued along Hanover Street. I noticed a crowd of people lined up to enter a shop on the street. It was called Mike’s Pastry, so I took some photos. I had seen people carrying boxes from Mike’s already as I walked through the city, so I figured this must be a well-known place. The signs inside show they serve many types of cannoli, as well as Boston cream pie. I didn’t take the time to stand in line, but decided I must visit here if I ever get back to Boston. 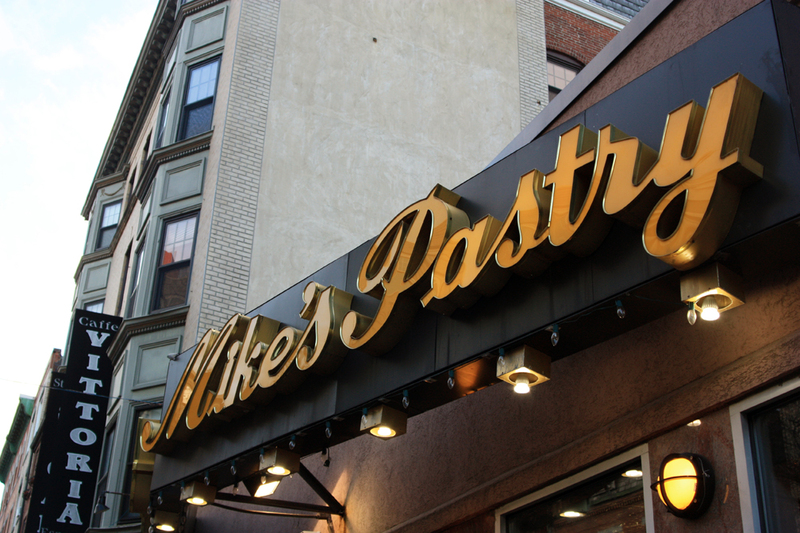 When I returned home to Utah, I asked one of our part-time teachers, Grady, about Mike’s and he confirmed it is considered the best place for pastries in Boston. Grady had taken a year out from college to work on Mitt Romney’s presidential campaign and had come to know Boston well. 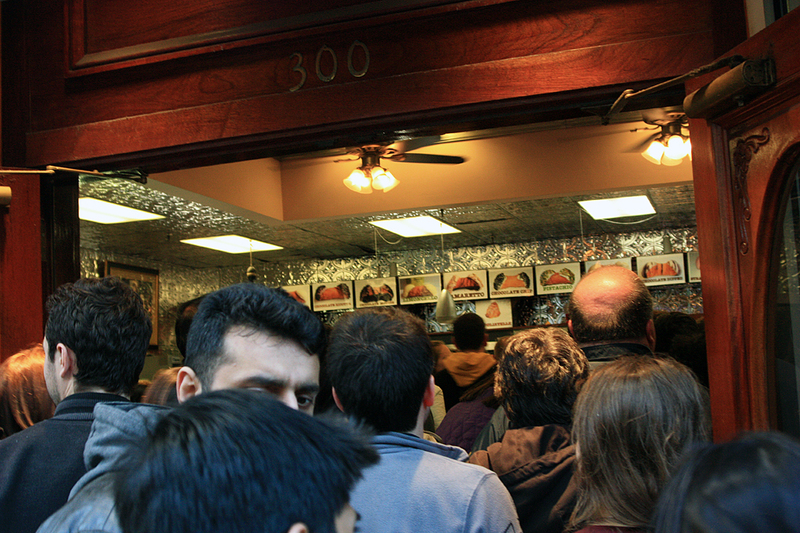 The crowd at Mike’s Pastry on a Saturday night. Cannoli, anyone? Sam Adams and John Hancock were considered public enemies, and left Boston to stay at a friends’ house in Lexington. The Minutemen militias in the communities around Boston started stockpiling arms in case of hostilities. The situation had become explosive. To prevent further provocation, the British soldiers were removed from the city and stationed on boats in the harbor and on Castle William, an island in the harbor. Hearing of the caches of arms in Middlesex County, Gov. Gage ordered troops to march on Concord and seize the cache there. Although not in the official orders, he also wanted to apprehend Adams and Hancock. What he didn’t know was that his own personal physician, Dr. Joseph Warren, was a Son of Liberty and passing on the Governor’s every move. 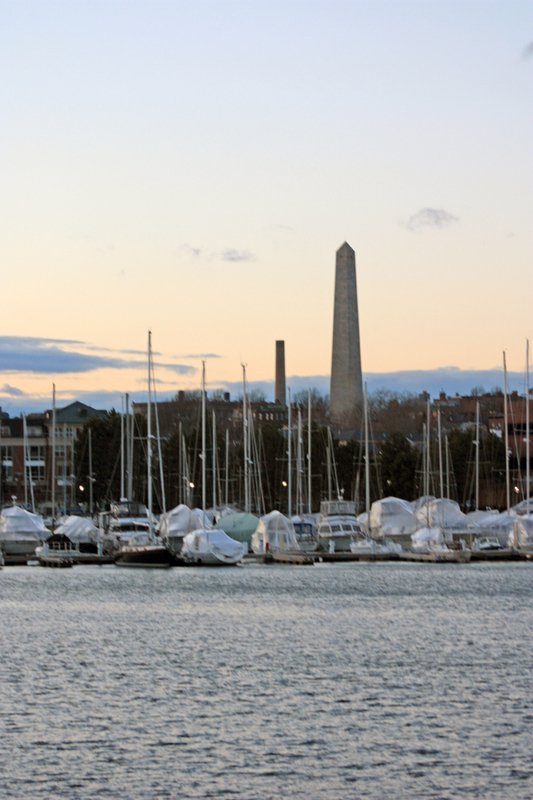 The group was warned of Gage’s intent to seize the arms, but they didn’t know one thing: how would the British Regulars move – by land from Charlestown or by water up the Charles River? Lookouts saw the British moving up the river, embarking near the north end of the Commons, so Revere hung two lanterns in the North Church belfry to signal a rider across the river, then decided to ride out himself. He asked friends to row him across the river to Charlestown. Even though the river was guarded at that time of night, he was able to slip past the British ships and reach the north shore of the river without incident. Over the hill past Copp’s Hill Burial Ground. A pylon of the new Zakim-Bunker Hill bridge is visible. 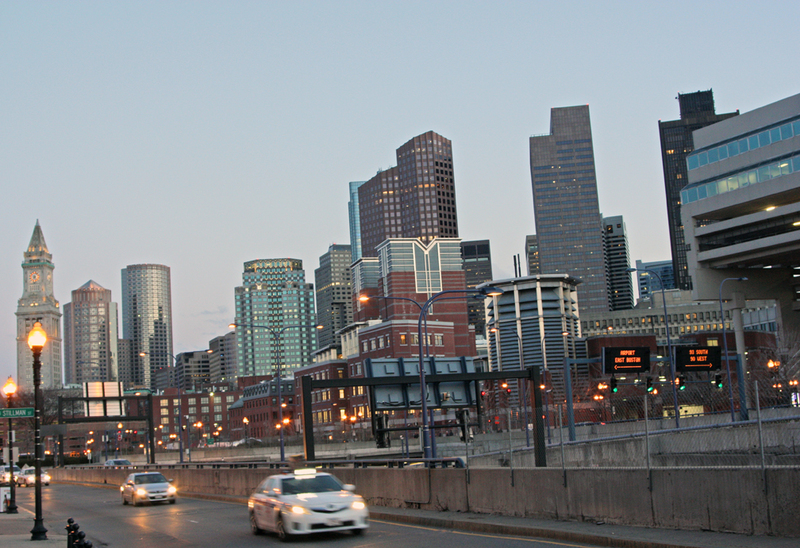 It was built ten years ago as part of the Big Dig, which restructured I-93 through Boston, among other changes. William Dawes was also dispatched by Dr. Warren to give the alarm. They took separate routes through Middlesex County, and at each stop more riders spread in every direction, until dozens of men and one woman were rousing the countryside that the British soldiers were on the march. Revere took a northerly route from Charlestown; Dawes traveled south across Boston Neck and around to Lexington. 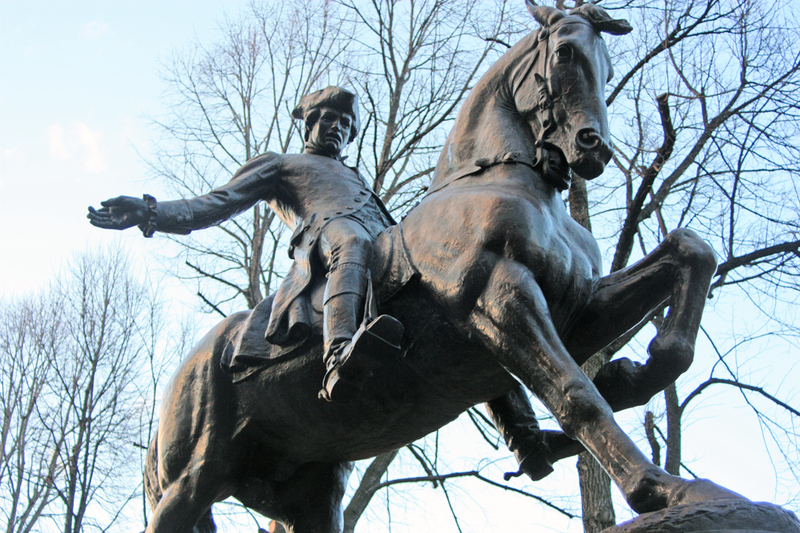 Paul Revere: Midnight rider, silversmith, patriot, and copper magnate. Revere made it to the Hancock-Clarke home in Lexington first, followed shortly by Dawes. They warned Adams and Hancock that the Regulars intended to arrest them and helped them pack up and leave. Then they decided to ride on to Concord in case the arms cache was the real target. Dawes had been instrumental in smuggling several cannon out of Boston, which were hidden in Concord, and he wanted to ensure their safety. They met Dr. Samuel Prescott on the way, who agreed to ride with them. They were waylaid by British sentries on the road to Concord and decided to make a break for it, each scattering in separate directions. Dawes rode into a local house’s courtyard and yelled that the Regulars were coming. Fearing the house’s occupants would turn on them, the soldiers turned back. But then Dawes’ horse bucked him off and he had to walk back to Lexington. Revere was apprehended and held captive. Only Prescott made it to Concord to warn the militia there. Routes taken by Revere, Dawes, and the British Regulars on April 18-19, 1775. I walked up over the hill past Copp’s Burial Ground and down to the walking trail along the river. It was too late for me to walk across the bridge and climb Bunker Hill, but I could look across to the monument there and the masts of the U.S.S. Constitution in the naval yard. As I watched, a canon boomed out and the United States flag was lowered from the yardarm of the Constitution. I imagined what this area looked like back then, as Revere, Dawes, and others rode out to warn the countryside. The masts of the U.S.S. Constitution, looking across the Charles River and Boston Harbor to Charlestown. The British expedition was poorly organized and they didn’t get all their men and supplies over the river to Cambridge until after midnight. The men had to unload the barges in knee high mud and water, and then faced a 17-mile march to Concord. As they marched toward Lexington, they heard the sounds of alarm being raised all around and knew they had lost the element of surprise. The column of about 500 British regulars could see militiamen running toward the commons in Lexington as they marched up the road. The colonial militia was beginning to form up in the square as others were running behind the fence lines along the road toward the green. The colonial leader, John Parker, ordered his men to hold their fire unless they were fired upon, but he was suffering from tuberculosis and his voice was not well heard. 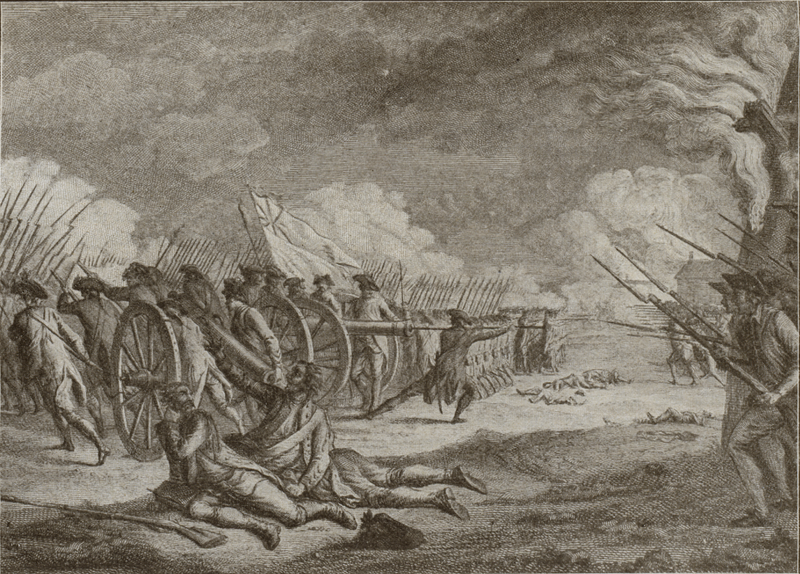 Engraving of the Battle of Lexington Green, April 19, 1775. The redcoats saw the militia forming on Lexington Green and the commanding officer, Lt. Col. Francis Smith, ordered Major John Pitcairn ahead. Just at sunrise on April 19, Pitcairn marched his men rapidly into the square yelling “Huzzah!” He hoped to surround and confuse the colonists. At this moment a shot or two rang out. It is not known for certain who fired it. I’ve read eyewitness accounts and sworn affidavits from both sides, including colonials and Regulars. The colonials swear that Pitcairn gave the order to fire. The British all swear that they first heard several shots coming from the colonials (probably from the militiamen hiding behind fences), and that Pitcairn was merely trying to defend his men. This was the “Shot heard round the world.” In the confusion, no one knows for sure. It wasn’t much of a battle – merely a skirmish. Eight colonists were killed and the rest withdrew. The British marched on to Concord. But the intentions of the British had been known days in advance, and the most of the arms were already moved away. The Regulars searched through the town but found only a few buried cannon, some ammunition, and some food stores. Prescott’s warning gave the militia time to form up properly, and they stayed on a hill overlooking the town as the regulars searched. More militia were arriving continuously from outlying farms until they outnumbered the Regulars. The British captain in charge of defending the North Bridge was inexperienced and became spooked by the nearby militia units. He retreated back across the bridge and set up a formation more appropriate for street fighting than for fighting on open ground. One of the Regulars fired a warning shot as the militia advanced, and several other regulars joined in. The colonials fired back and several British were killed. Seeing that his mission to Concord was useless and fearing an organized attack, Lt. Col. Smith ordered a withdrawal from Concord. More militia arrived and harried the British; they fought a running battle all the way back to Lexington, where they received reinforcements. They rested briefly, then withdrew back toward Charlestown, fighting all the way, and trying to maintain disciplined columns while the colonists ran a shifting engagement. They would ambush the British from every defensive position, including groves of trees, bends in the road, and houses. The 1700 British Regulars marched in a military square with flanking parties sent out to drive the Americans from their positions, but the colonials simply faded back and around the British to harass them again. The British were exhausted and short on ammunition whereas the Americans were now almost 4000 strong. By the time they made it to Charlestown, the British had suffered far more casualties than the Americans. That’s how the Revolutionary War began. It might not be what you read in Longfellow’s poem, but there it is. As a history teacher, I’m fascinated by the first-person accounts of what happened and the decisions that led to revolution. It seems the British government completely misunderstood the needs of the colonists, and botched the whole thing. Of course, the Sons of Liberty were definitely radical hot heads who forced the issue through protests and outright rebellion. What was the Crown to do but make an example of them? But everything they did only made the situation worse. This street marker sums it all up. As night came on I walked back through Boston to the Commons. 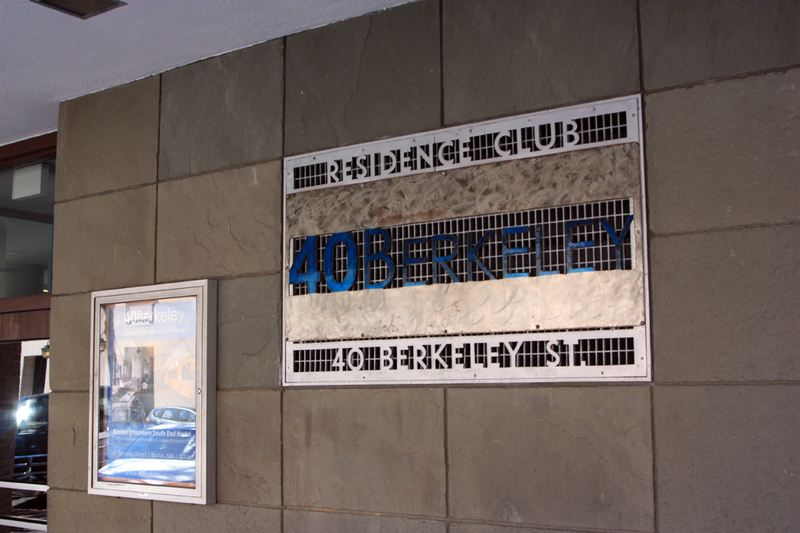 A bitterly cold wind began to blow off the harbor, and I was glad to get back to the warmth of my room at 40 Berkeley. I’ve learned so much more about events that led to the Revolution by walking through the very streets where it happened. I must return some day and also visit Lexington and Concord and see the places where it all started. I hear a new miniseries called The Sons of Liberty will air on the History Channel in January. I hope they get it right. I am a pack rat. I grew up with my grandparents living next door in my hometown of Deseret, Utah. Both my parents and grandparents lived through the Great Depression and never wanted to throw anything away. Anything that could be salvaged and re-tasked or reused was kept in case it might come in handy later. 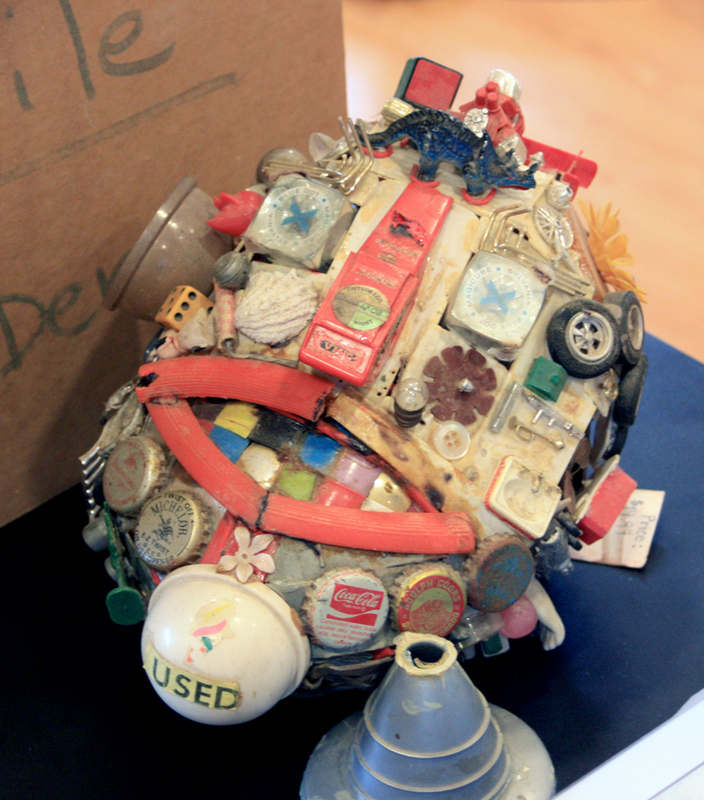 This is Herbie the Head, my first junk sculpture. It’s a bit the worse for time. The frame is made of welded plastic girders. The neck and support are the rocket nozzle and heat shield of an Apollo space capsule. I have the same compulsion, only in my case I collect objects that are clearly past being useful for their original purpose. In other words, I collect junk. But I’ve done some things with it, including making sculptures from the junk. This started during the summer after I graduated from high school. I went on a long wilderness trek wearing old boots. The trek included a 25-mile hike during a single day and night, and by the time I finally got to camp I had 16 blisters on my feet and toes. By the time I got home again, I had to take a few days off from walking or wearing shoes to let all of these blisters heal. 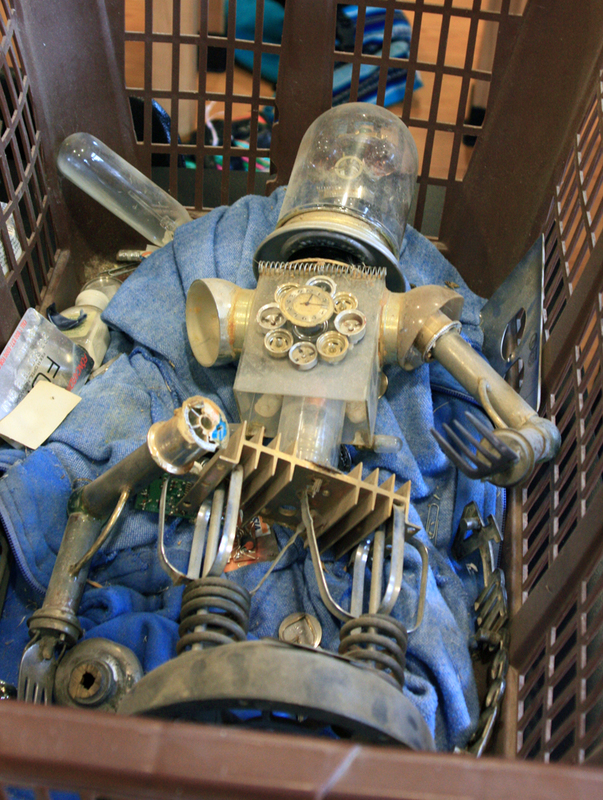 Philo the Robot, named for Philo T. Farnsworth, the inventor of television. He needs some repairs. I decided to spend the time making something fun out of my old model kits that had all fallen apart but which I hadn’t thrown away. These included everything from a funky bathtub car to a five-foot model of a Saturn V rocket. I took the girders that held the plastic parts and used a candle to melt them together to form the frame of a head, then glued in parts and other interesting objects. The end result was rather fun, and I called the junk head “Herbie” after the Love Bug in the old Disney movies. I decided (over my mom’s protests) to enter the sculpture in the county fair. It won a sweepstakes prize! Looking through junk, coming up with ideas. 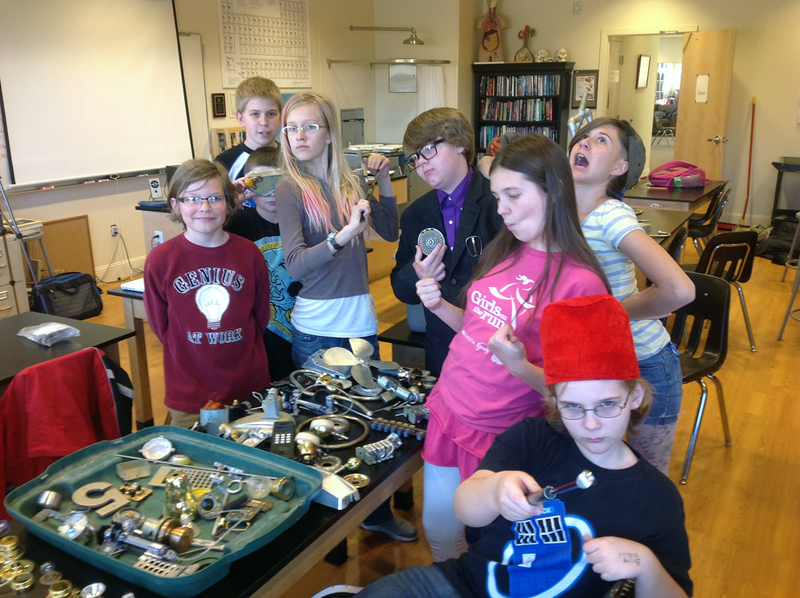 Demolishing used electronics, including old VCRs, DVD players, phones, remote controls, and calculators. With that bit of undeserved encouragement, I continued to build other sculptures, including a robot (Philo), a three-legged dog, even a working lamp which tripped the circuit breaker the first time I turned it on. I’ve kept the robot in repair, mostly, but the others have fallen apart due to the deterioration of the glue from UV light. Yet I’ve kept all the parts. 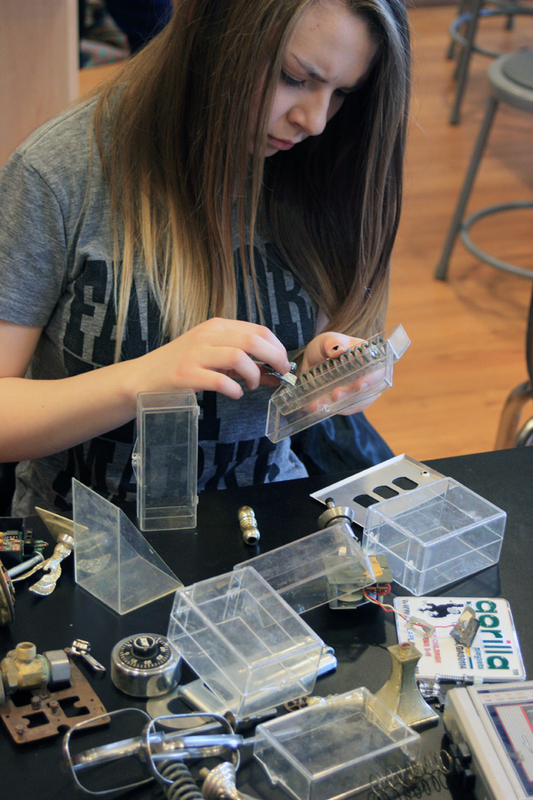 Assembling the junk using engineering and material science knowledge. 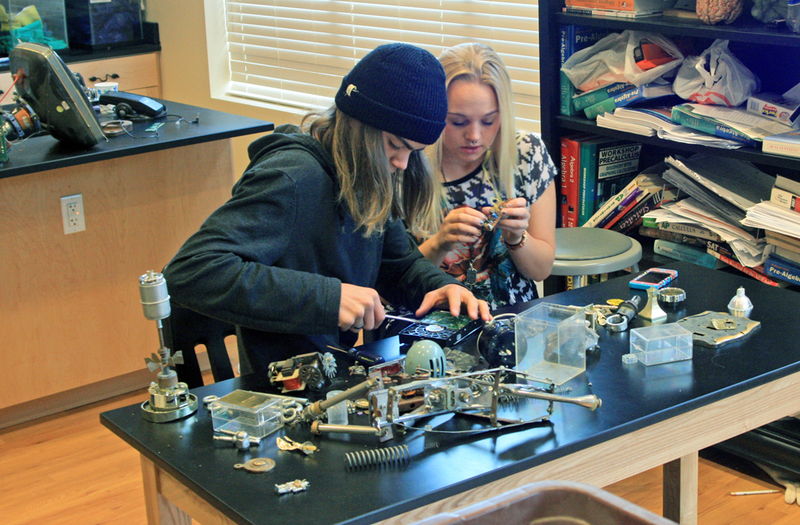 It occurred to me last fall, as I was starting up the STEM-Arts Alliance project at Walden School, that it might be fun to teach a junk sculpture class for our Intersession program. We take two weeks between third and fourth terms to teach specialty classes. So I got approval and wrote up a description and had about ten students sign up. I bought some tools and various glues, nuts, bolts, screws, etc. and carried all my boxes of junk into school. It was quite the collection by now. Although this is essentially an art project, I knew that it also tested one’s ability to attach and adapt different objects made from widely different materials. In other words, this was really a material science and engineering project. The students looked through the junk, came up with ideas, and were required to plan and sketch out their designs, including how they planned to attach the parts together. They had to use secure fasteners such as nuts and bolts for any load bearing members. Small sculptures created by students at Walden School. The end results were well done, and those that did the most planning were the most successful. We used drills, saws, Dremmel tools, soldering irons, hot glue guns, epoxy, and other materials to cut and adapt parts, then fasten them together. 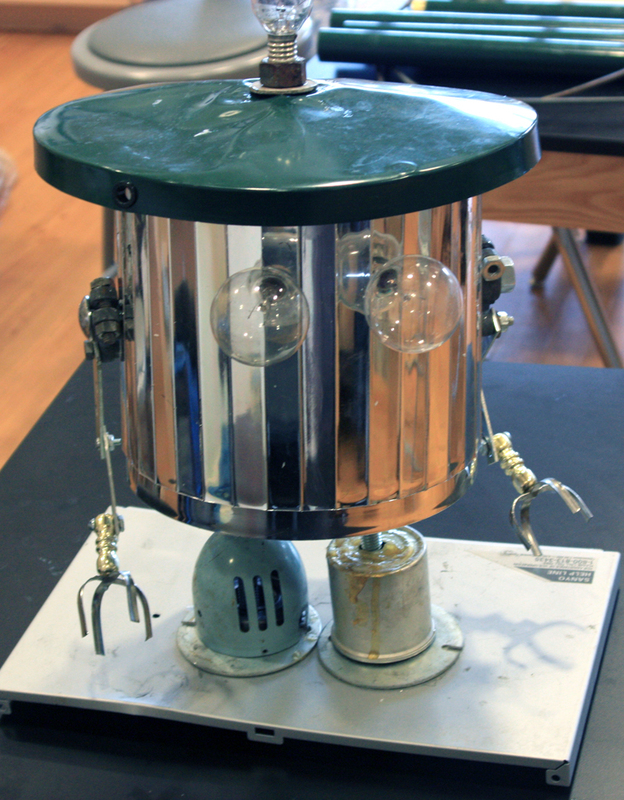 A robot created by a student from found and re-tasked objects. Even after having ten students built projects, I still had junk left. In fact, it seemed I had more than when I started. 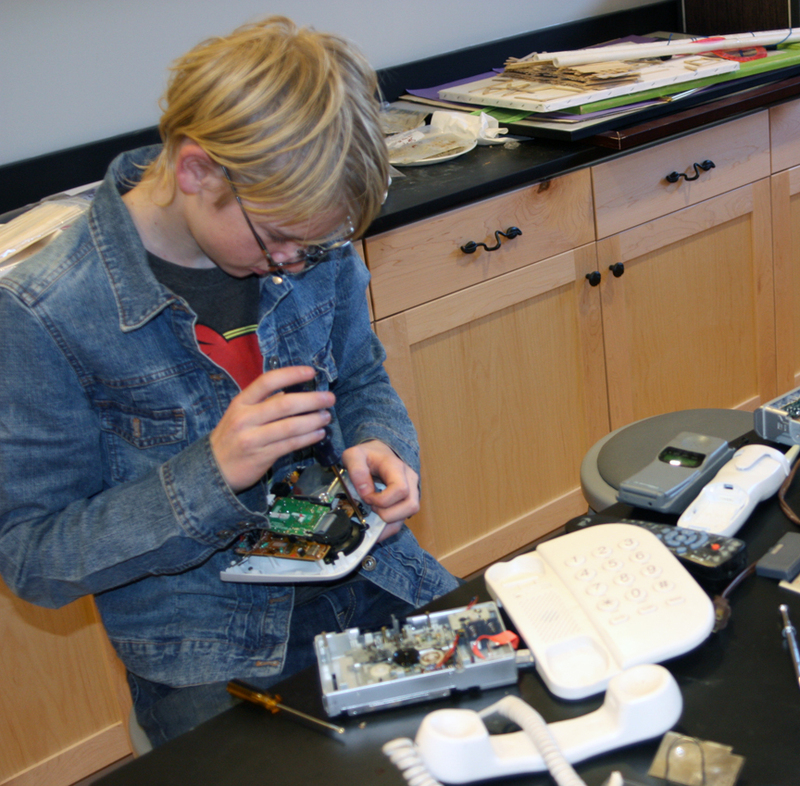 I had kept all my old broken VCRs and DVDs, telephones and calculators, and other electronic junk, which the students tore apart. There is some fascinating stuff in there. So I decided to try the class again as a fall after school club. I named it the STEAMpunk Club, which I thought was a nice play on words. 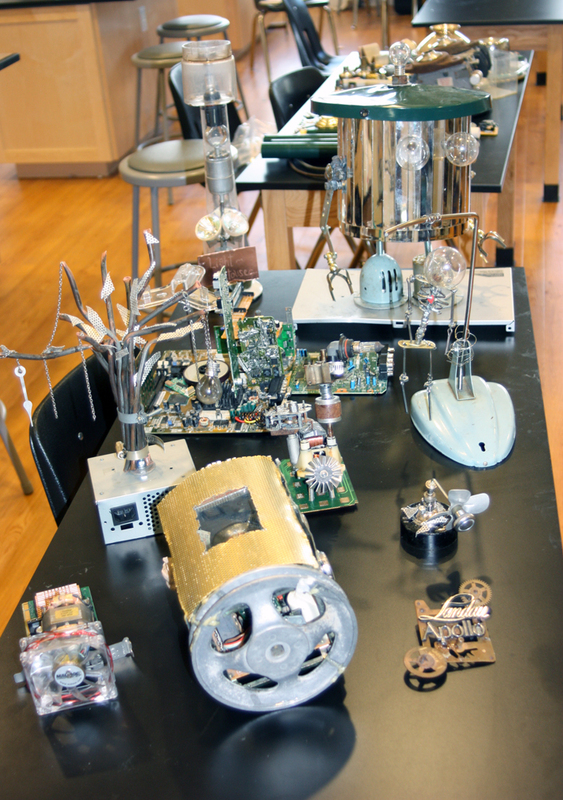 Some of the final sculptures by the Junk Art class at Walden School. 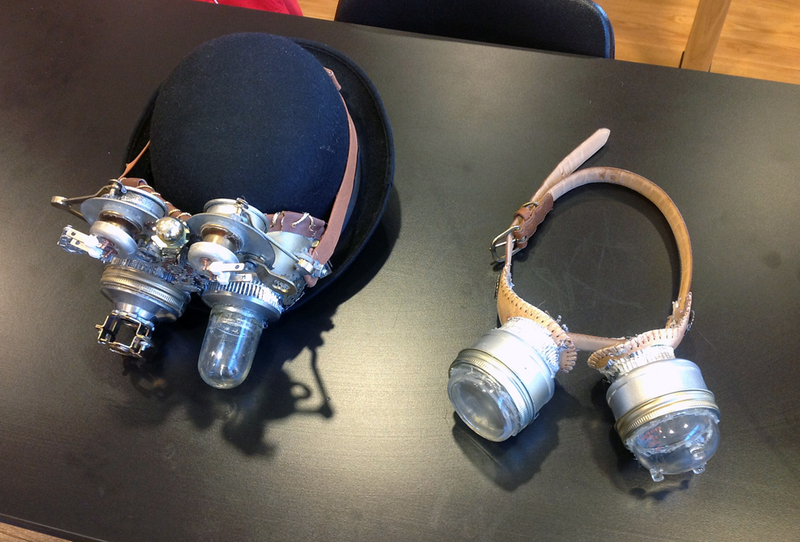 Our objective was to build steampunk goggles and other costume items for Halloween. I went to dollar stores and hardware stores looking for possibilities for objects that could be re-tasked. Princess tiaras and canning jar rings became telephoto lenses, and old softballs became leather eyepieces. 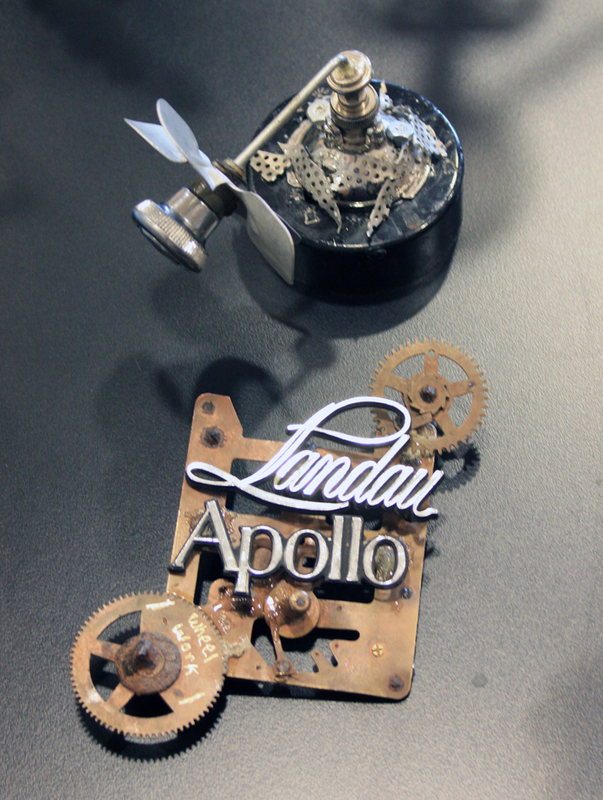 We added gear decorations and plastic parts that had been spray painted silver and gold. I also found a black derby hat for cheap in a discount store and tied my elaborate goggles to it with safety pins. I also made a second, less ornate set of goggles. I wore these with my old black coat and completed a pretty good steampunk costume. The next time ComicCon comes to town, I’ll be ready. 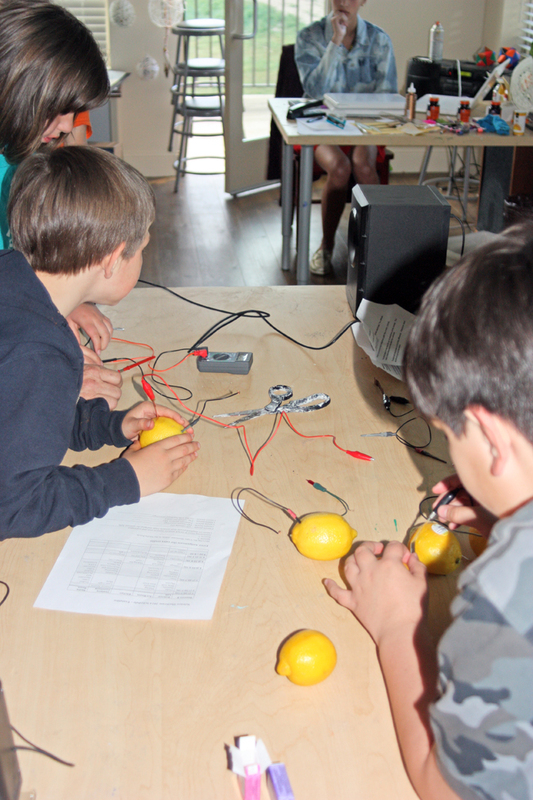 The students came up with interesting goggles and props of their own, and even a few more junk sculptures. I have planned out a larger sculpture for my classroom, another robot that will stand about three feet tall and have a framework or core of glued, spray-painted PVC pipe for strength and structure. I have collected all the parts, and hope to complete him sometime in the spring when my workshop warms up again. 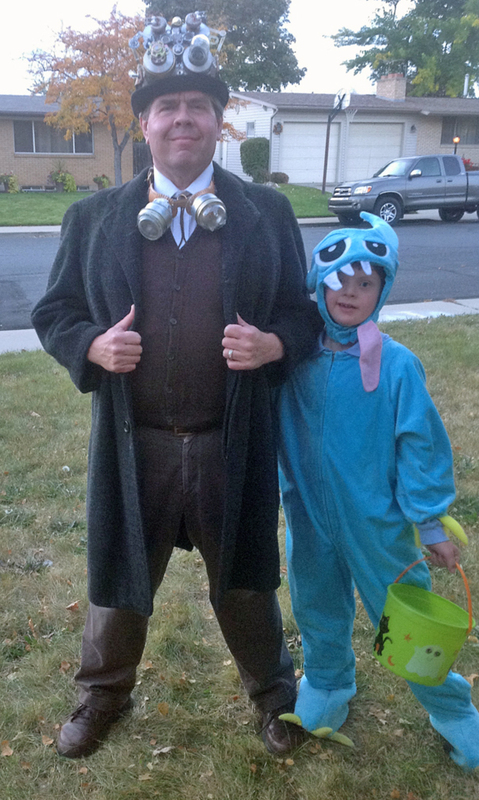 My Halloween steampunk costume, plus a monster. Maybe by next summer I will have exorcised this current drive to make junk sculptures. 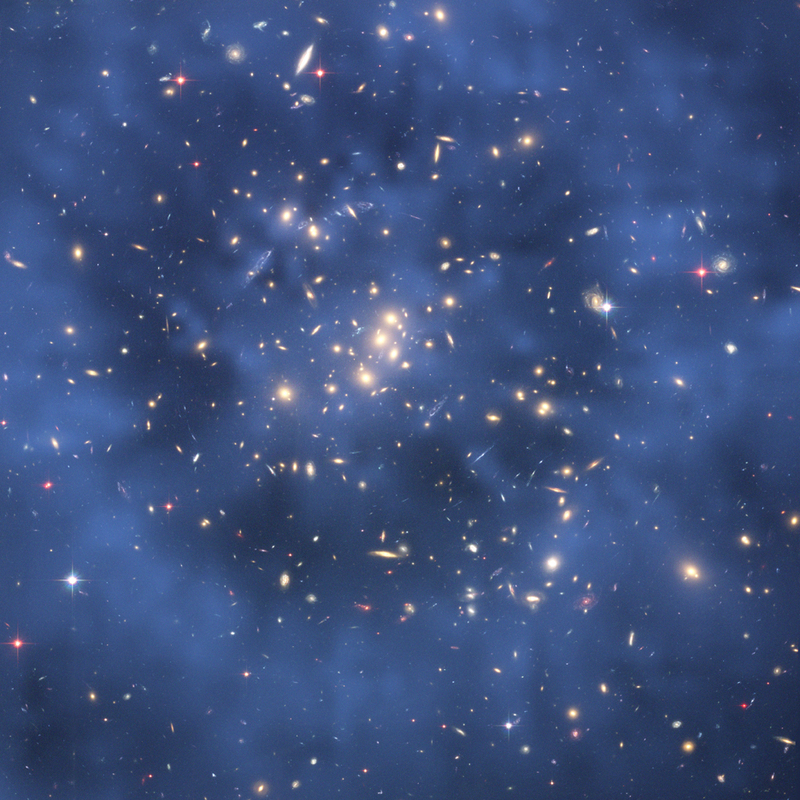 I seem to vibrate between several modes or interests, including science, history, and art. Lately, I’ve been in an art mode, which is why I decided to initiate the STEM-Arts Alliance in the first place; it would give me a chance to do all the things I love. It’s been fun so far, and I think my students have responded well and enjoyed the crossover opportunities. I know these projects are a bit idiosyncratic and won’t generalize to most teacher’s classrooms, but then again, maybe someone out there can use this idea to their own advantage. I’d love to hear what you come up with. This post will be out of sequence, but I want to add it and two others before posting on our activities this fall for the 2014-15 school year. I’ve been so busy doing chemistry activities with current students that I haven’t taken the opportunity to share them here. Time slips away. 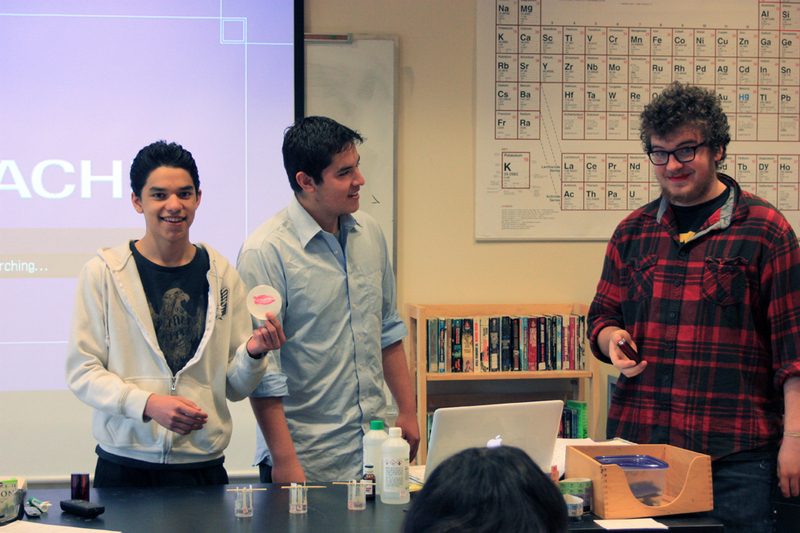 Elijah and Ben demonstrate how to use lip prints in forensic science, with some help from Joshua. 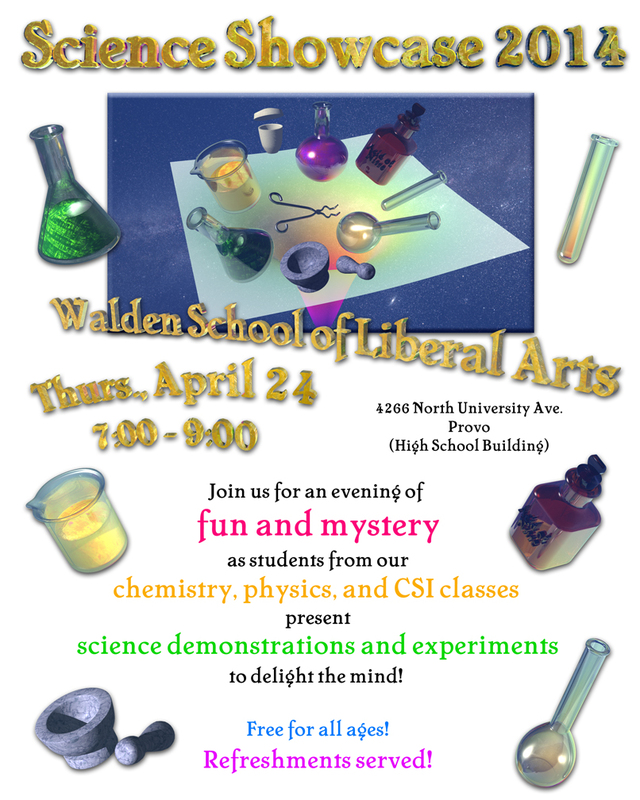 During my first year at Walden School of Liberal Arts, we instituted the first “annual” Science Showcase to provide my students the chance to demonstrate what they have learned. Due to the nature of my classes and other factors, I wasn’t able to make the event quite as “annual” as I had hoped. But this year I taught chemistry, physics, and forensic science during the second semester and although my classes were small, I figured I had a critical mass of students to make the Showcase possible again. 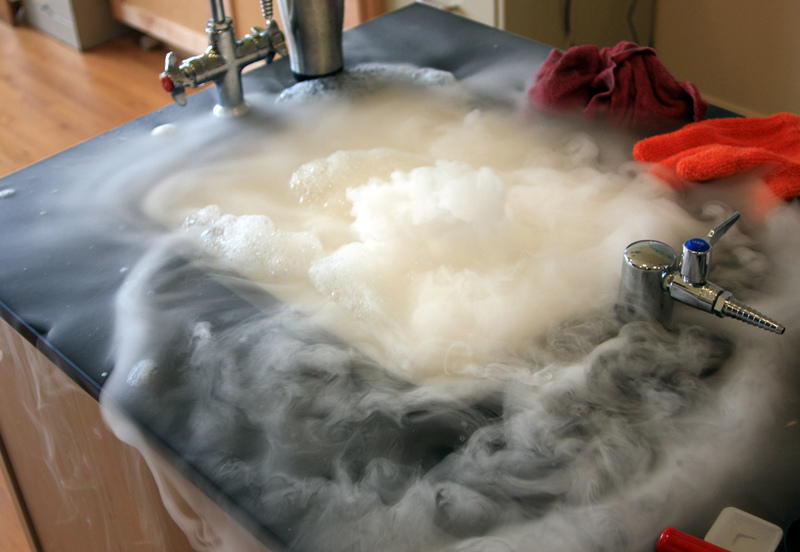 A demonstration of dry ice in water with soap solution. To prepare the students, I had them work in pairs to pick a topic related to their class (such as hair analysis or chromatography in forensic science). They researched the topic beyond what I had already taught them in class and wrote up a brief 15-minute lesson plan, which included an active, hands-on demonstration and a handout for participants to take home with URLs where they could find out more. 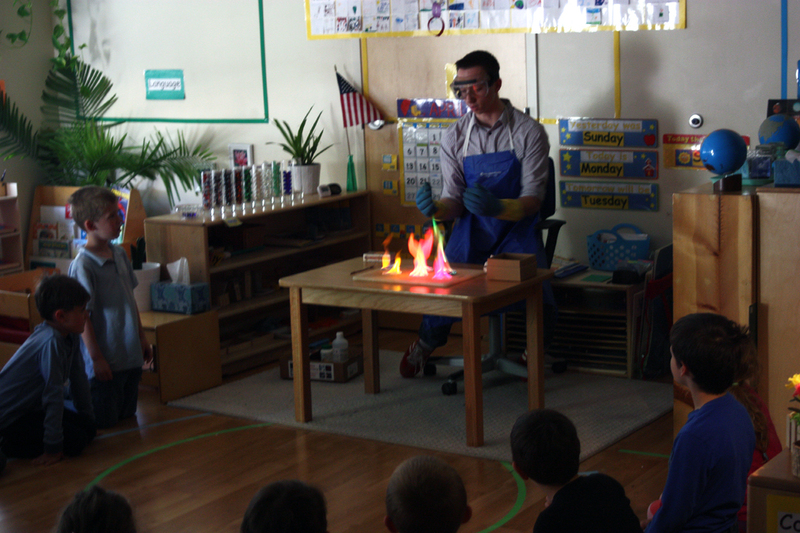 Evan demonstrates the colors of salts in methanol flames for a kindergarten class. Note: We were careful to follow safety precautions and use only small amounts of methanol, keeping the bottle well away from the flames. They practiced their lessons, as much as we had time, and presented them to their peers in class. This was their alpha test. There were many creative projects. One student (Jessica) brought in some old speakers. We cut holes through the grills over the woofers and glued wires to the center of the woofers, then glued small mirrors to the wires. A laser light show, made by bouncing laser beams off of mirrors attached to the woofers of stereo speakers. We played music with a heavy beat through the speakers and bounced three colors of lasers off the mirrors to create a laser light show. 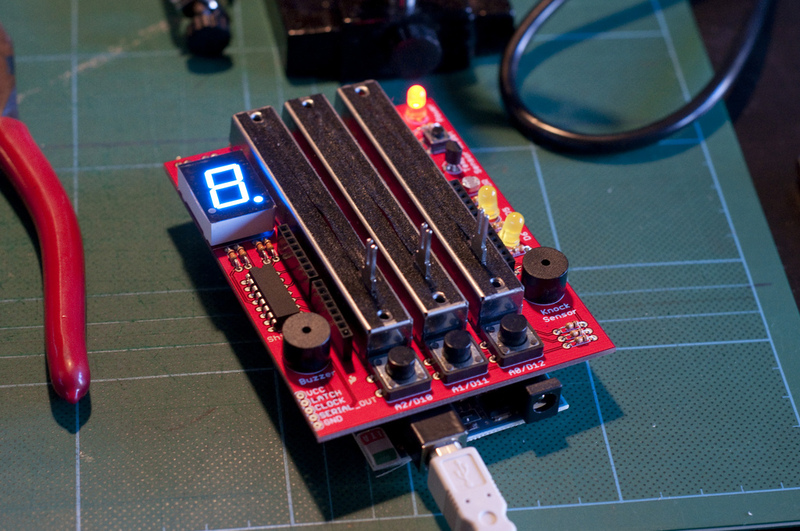 It took some tweaking, but we got it to work well enough. Their peers filled out anonymous evaluation sheets for each presentation, which I averaged and discussed with the groups so they would know how to improve. 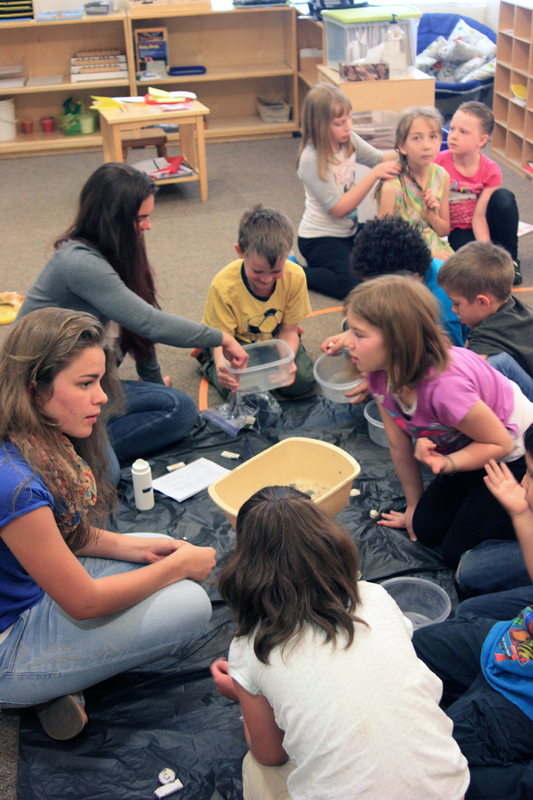 Elena presenting magnetism to an elementary class at Walden School. Once they had revised their presentations, we took the show on the road and visited classes in our elementary and middle school. This was our beta test. I had asked the teachers in advance which of the presentations they would like, depending on the topic and their own core objectives. 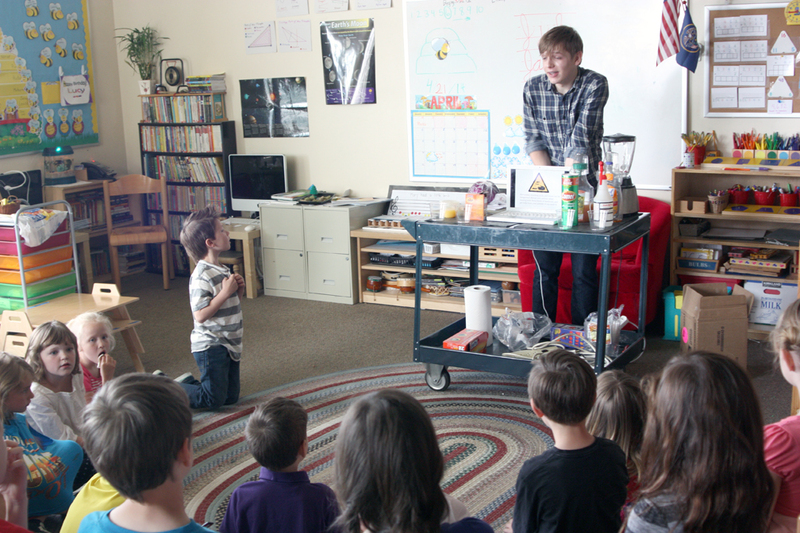 My students presented such topics as making ice cream (colligative properties of solutions) in plastic bags, the properties of magnets, colored flames, lemon batteries, making gak, and red cabbage pH. Many of these are old standbys, but they also usually turn out well. Some of the more untried ideas didn’t work as well in front of a live audience, but that’s to be expected. I talked with the teachers and shared their suggestions with the student teams. Finally, with the presentations fine-tuned, we held a public Science Showcase night at our new high school building. I was going to present a few demonstrations myself, but got so busy getting all the students ready that I skipped over my presentation and simply introduced the night’s events. 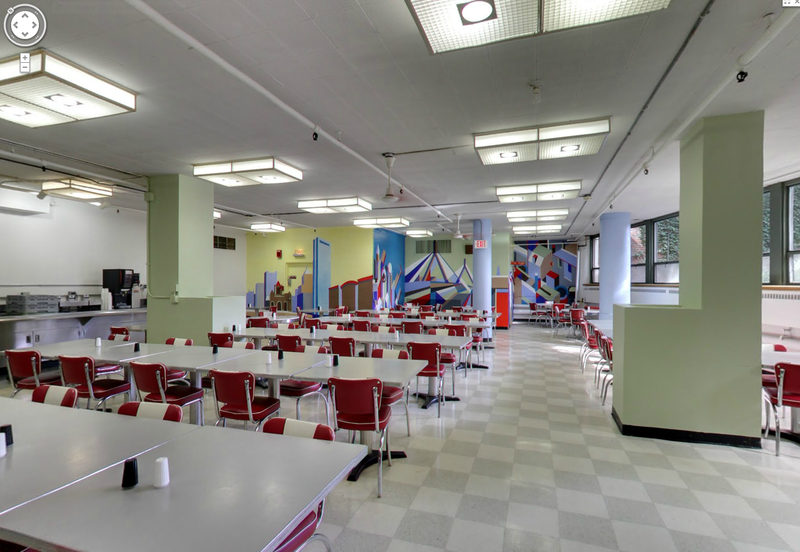 We met in the large common room upstairs, and the turnout was a bit smaller than I wanted. I must make a note to do more advertising next year. I had sent flyers home with the elementary students and advertised through the school newsletter, but I needed to do more sooner. 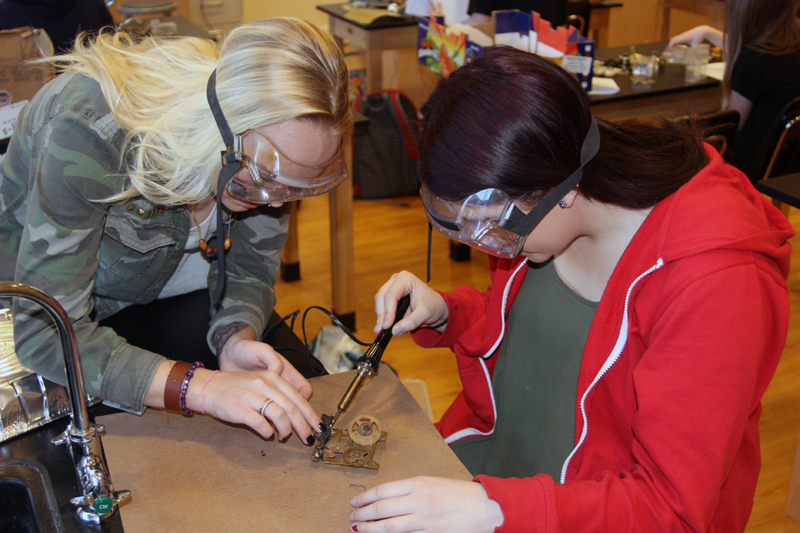 Teresita and Savannah demonstrate how hair analysis is used in forensic science. The student presentations were held in four different rooms, with a viewing of the student-created videos done this year in my media design room. We held a new session every 20 minutes for two hours over 4-5 rooms. Some of the sessions had a good number of people attend, some not so much. One of my former students who presented in our showcase three years ago jumped in and kind of took over one of the student’s presentations. I appreciate her enthusiasm, but the presenter needed the experience. 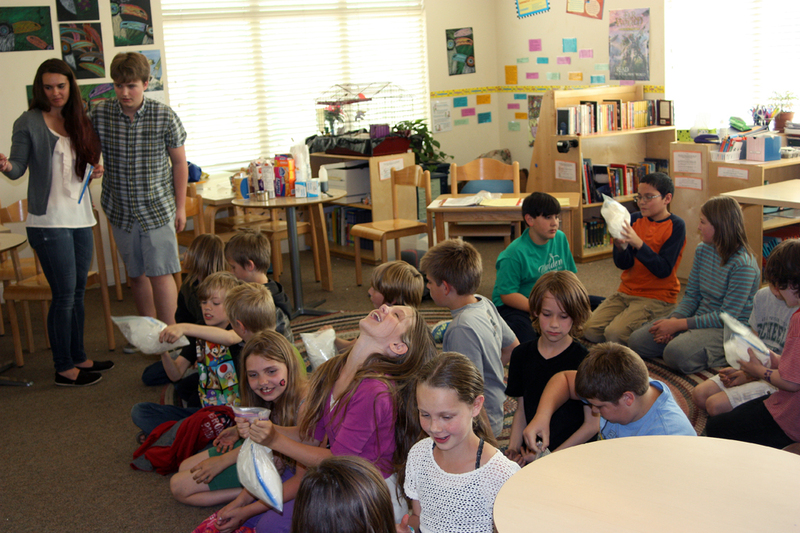 The making ice cream session was highly attended and went overtime and made a big mess. Note to self: let’s not do that one next year. It was also expensive. We made homemade root beer as well and had root beer floats with the homemade ice cream. We had some nice tasting slush at the end. We also had our science fair students display their projects – that needs to be more central where people going back and forth can look at them. 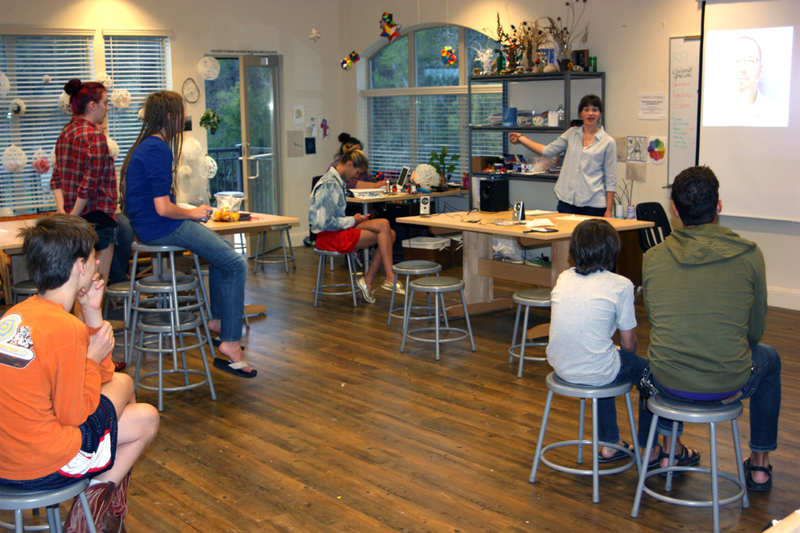 I did put all the student STEM-Arts Alliance projects on tables in the commons, including our marbled paper, drawings with homemade ink, homemade watercolor paintings, and even our junk sculptures and jewelry from the Intersession classes I taught. I had signs out with them describing what we had done, and these were looked at by most of the participants. We also had students take cameras around to the sessions to document what we’d done, but they should have received more training. 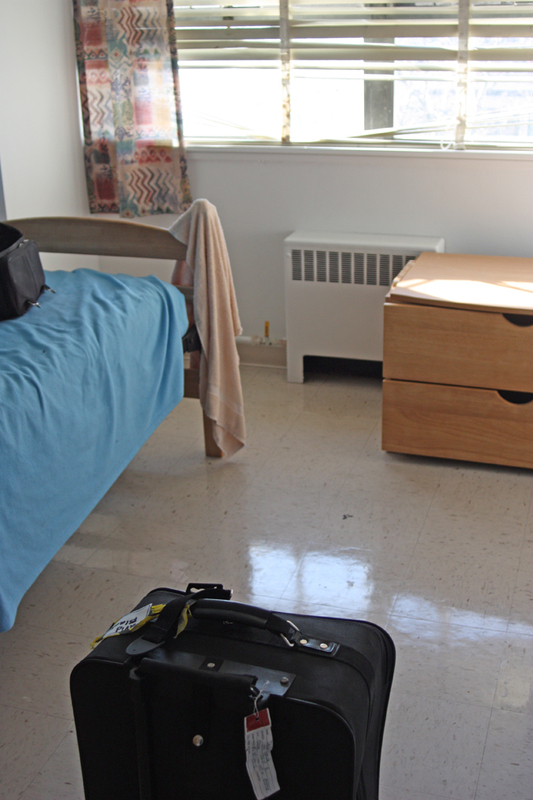 When the Showcase was done the students stayed and cleaned up, and I was exhausted. I need to delegate more, and get more teachers involved. We had about 80 people there, total, including students. I think it was very successful overall. The day after I debriefed the students and had them write down suggestions and comments about how to improve for next year. I did this whole process in about three weeks. 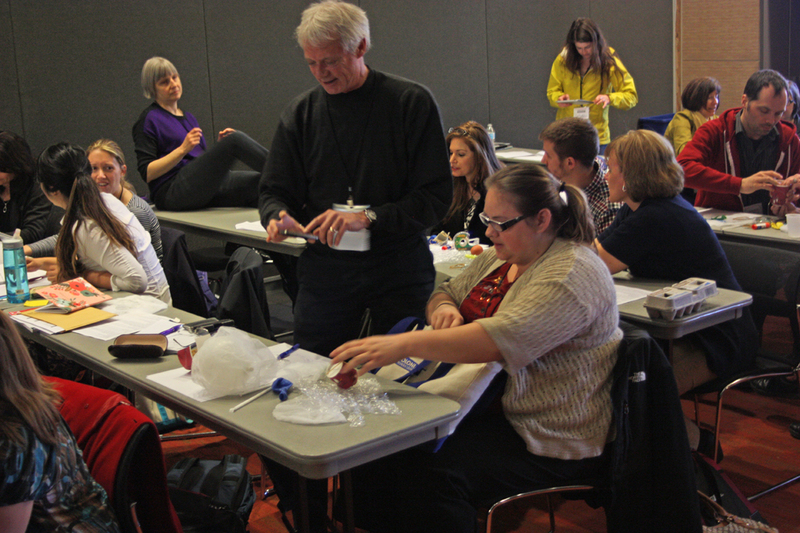 There wasn’t enough time for students to really absorb the experience and make improvements. Not all the students were ready, such as not having really polished handouts and lesson plans, so more time to review and improve is needed. I should spread each phase out over about 5-6 weeks, with a week off between to prepare for the next phase. We need to have ushers to direct attendees and avoid having too many in one room or not enough in another, and to keep the sessions moving and on time. When I have discussed this project with other teachers, they invariably say how this could be a great thing for their students but they just can’t take the time out of their curriculum. It’s hard for me as well. It took about ten class periods to pull this off, and it wasn’t enough at that. I have to be able to truly justify taking all this time. To decide whether to do any project or not, I have to look at all the standards that I am required to teach. I’ve tried to outline all of them in a comparative Excel spreadsheet. I have to teach to Utah’s science content standards for each of my classes. I also have to teach to what are called the Utah Intended Learning Outcomes, or ILOs, which contain objectives on the nature and history of science and its impact on society. 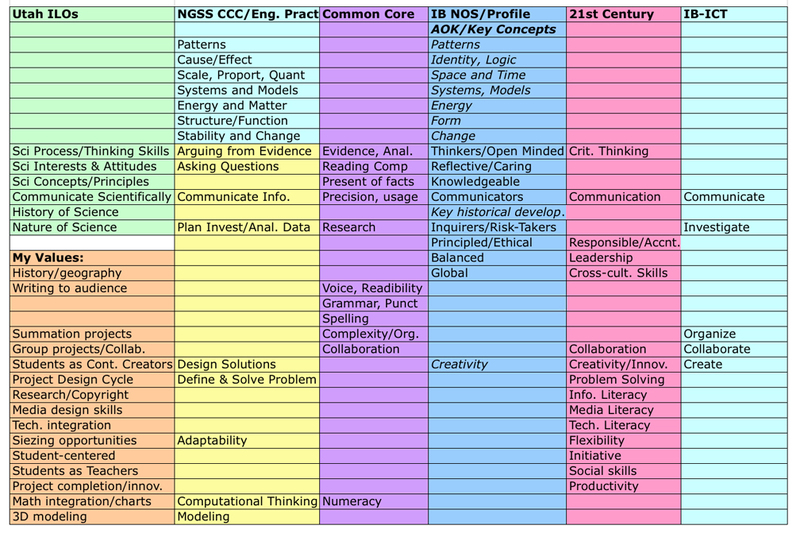 A cross-comparison of the various sets of educational standards I am expected to address. It’s enough to make a grown man cry . . .
Key: Orange: My own personal priorities/standards. 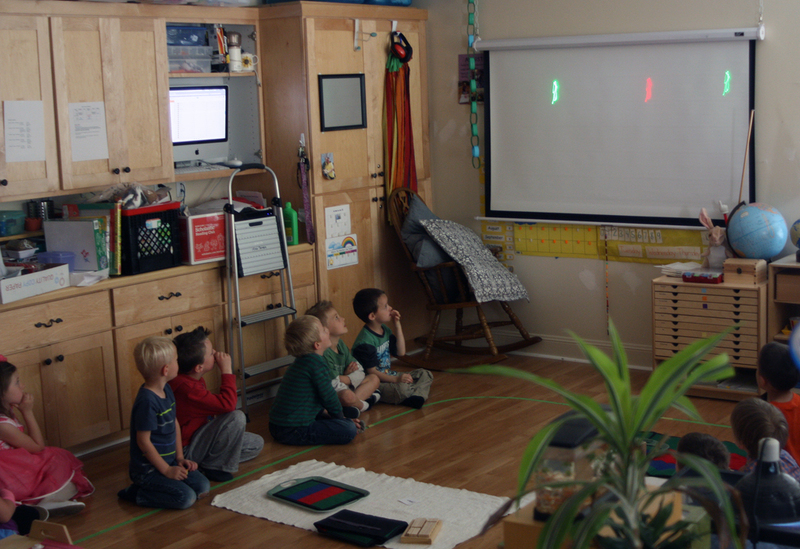 Light green: Utah Intended Learning Outcomes. 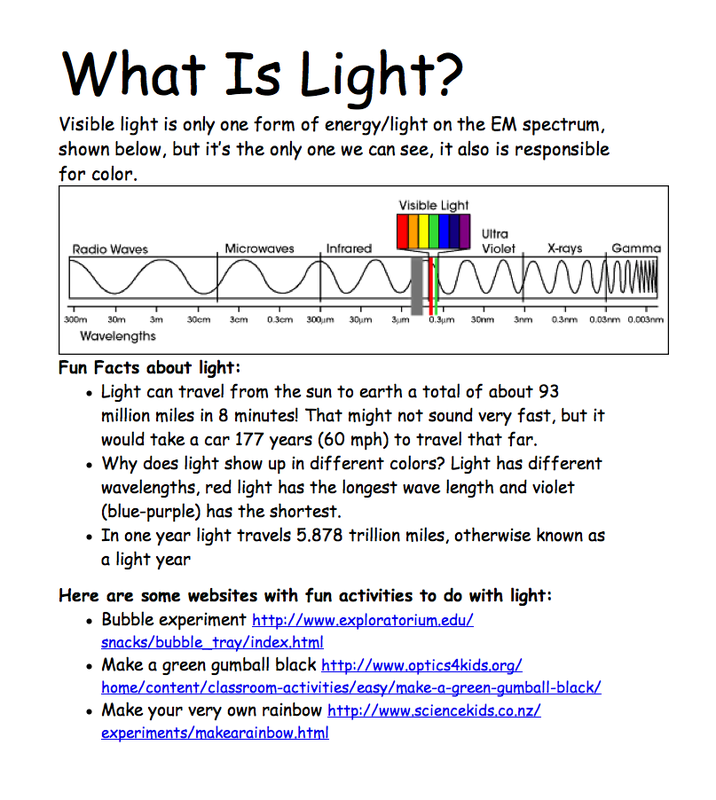 Light aqua: NGSS crosscutting concepts. Yellow: NGSS Engineering Practices. Purple: Common core. Blue: International Baccalaureate Nature of Science, Learner Profile, and Science Key Concepts. Pink: 21st Century Skills. Light Aqua: IB Information and Communication Technology standards. 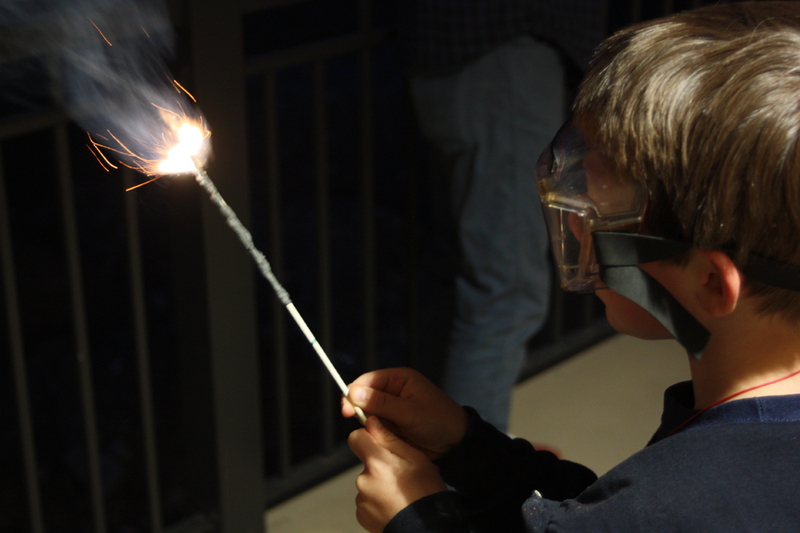 Utah is in the process of revising its science standards, and will likely adopt some of the ideas from the Next Generation Science Standards including engineering practices and crosscutting concepts (more on this in a later post). I am anticipating and initiating the changes now. As a technology teacher, I try to adopt the 21st Century Skills objectives. Then there are the Common Core standards for math and English literacy, including learning to write and communicate. Finally, we are becoming an International Baccalaureate school and I am beginning to work those standards for the nature of science, the IB Learner Profile, the key concepts of science, and information technology standards into my classes as well. I also have my own goals and priorities/objectives for my classes that are every bit as important to me as all these externally imposed standards. That’s a lot of standards to address! 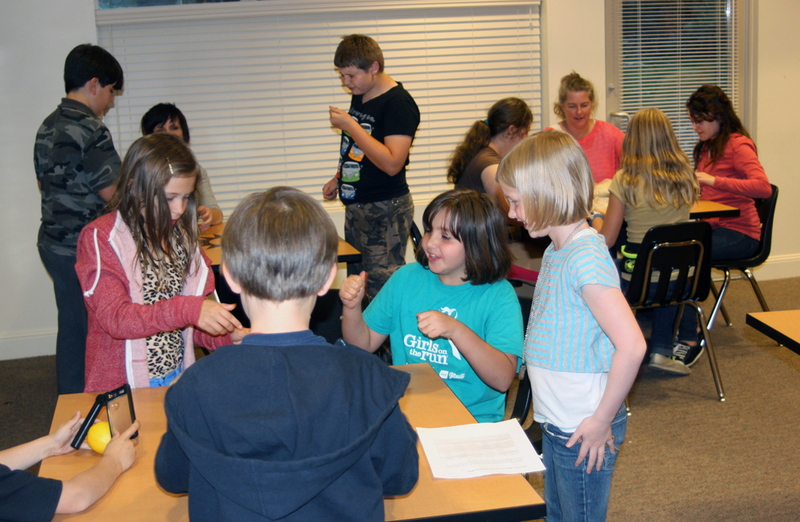 An activity during our Science Showcase night; April, 2014. Almost all of the standards I’ve listed above contain objectives for teaching communication skills and technology. Scientists have to be able to write proposals and grants, and communicate their ideas orally to the public and each other both formally and informally. The Science Showcase does this effectively and even efficiently. 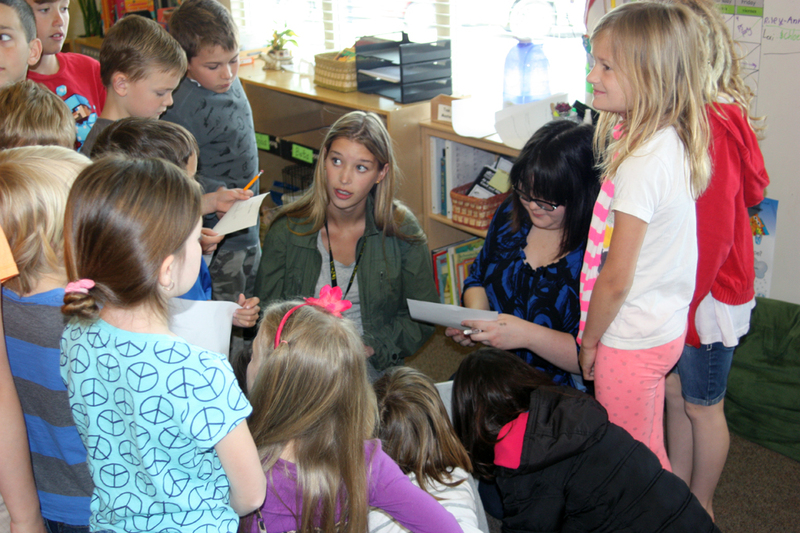 Unlike science fairs, where only a few students get to go on and have the full experience, the Showcase requires all students to learn communication skills. Students also learn science concepts very deeply; when you have to learn something well enough to explain and demonstrate it to others, you won’t easily forget it. So the Showcase can help students master science content objectives. The process of designing a lesson, presenting, getting feedback, revising, and presenting again is the same basic process used by engineers to solve problems, so I am teaching them engineering practices through the Science Showcase. It is also a good way to review for end-of-year Criterion Referenced Tests. 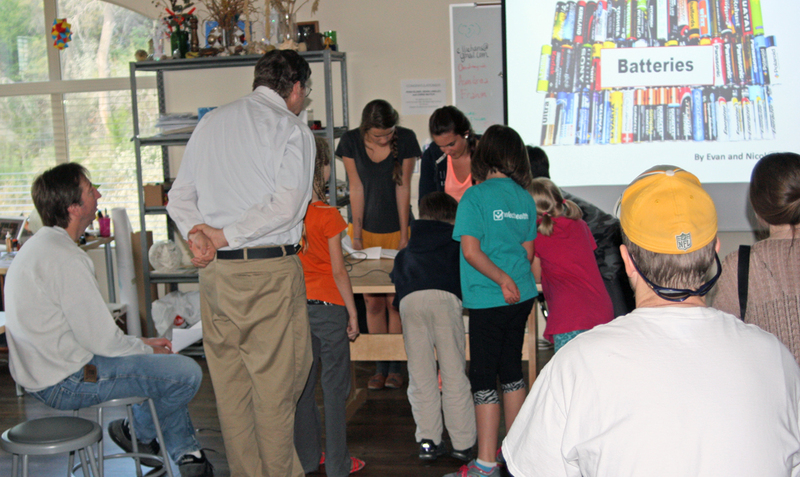 Finally, having my students present to their parents and siblings increases the excitement for science in our entire K-12 school. This isn’t an objective on any list of standards, but it is necessary for the growth and advancement of a science program. This project is consistently one of the most memorable things my students do each year, and therefore worth every bit of the time it takes.